The artichoke is a perennial vegetable in the sunflower family and is believed to be a native of the Mediterranean region. The artichoke that we eat is actually the plant’s flower bud. If allowed to flower, the blossoms measure up to seven inches in diameter and are a beautiful violet-blue color. 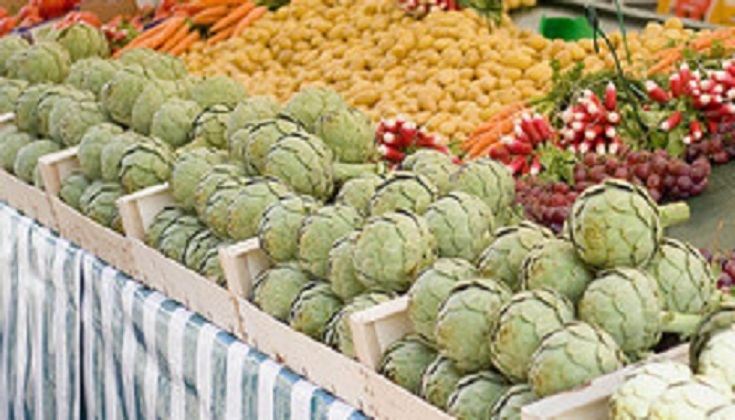 There are more than 140 artichoke varieties but less than 40 are grown commercially. Spring is the peak season and most artichokes grown worldwide are cultivated in France, Italy and Spain, while California provides nearly 100 percent of the United States crop. Select artichoke globes that are deep green, with a tight leaf formation and those that feel heavy for their size. A good test of freshness is to press the leaves against each other which should produce a squeaking sound. Browning of the tips can indicate age, but can also indicate frost damage. 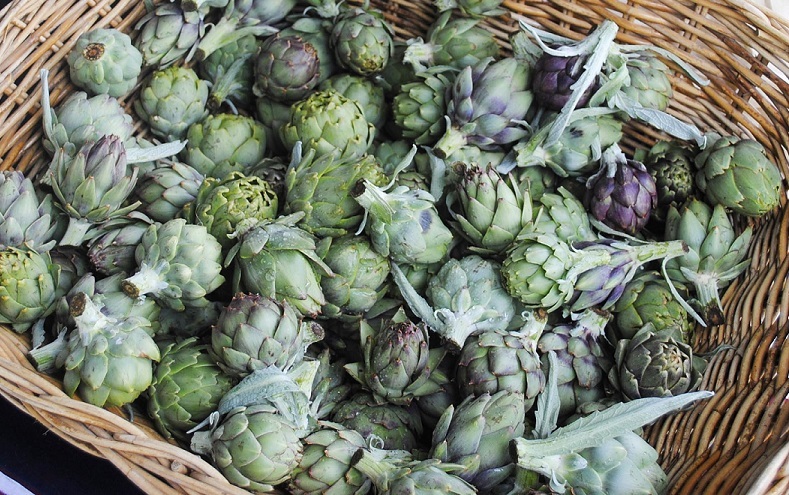 To store fresh artichokes at home, sprinkle them with a little water and refrigerate in an airtight plastic bag. Do not wash before storing. They should last a week when stored properly. Wash artichokes under cold, running water. Pull off the lower petals and cut off the bottom stems (cut flush with the base). Cut off about 1/2 inch of the pointed top of the artichoke. Pull out pale inner leaves from center. At the bottom is a furry bed, the choke. Use a spoon (a grapefruit spoon works wonderfully) to scoop out the choke. Always use a stainless-steel knife and a stainless-steel or glass pot. Iron or aluminum will turn artichokes an unappetizing blue or black. For the same reason, never let aluminum foil come in contact with artichokes. Trim tips of leaves with scissors to remove thorns. Dip in lemon juice to preserve color. Stand up the prepared artichoke in a deep saucepan or pot with 3-inches boiling water (if desired, oil, lemon juice and/or seasonings can be added to cooking water). Cover with a lid and gently boil approximately 25 to 40 minutes, depending on size of the artichokes, or until a petal near the center pulls out easily. When done cooking, remove from the pot and stand artichoke upside down on a rack to drain. Place prepared artichoke on a rack above 1- to 2-inches of boiling water. Cover and steam approximately 25 to 45 minutes, depending on size, or until a petal near the center pulls out easily. 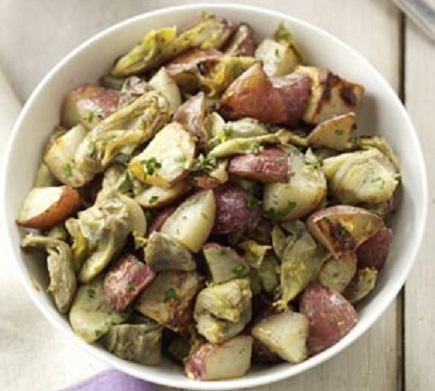 Small artichokes, which are being shipped fresh more frequently today, make a savory appetizer, salad or vegetable accompaniment when marinated, either whole or cut lengthwise in halves. They are also delicious in poultry, beef, pork or lamb stews. Baby artichokes are sold in plastic bags or containers or loose. Their size can vary from walnut to jumbo egg size. Size is no indication of age. (Some babies are bigger than other babies!) Choose baby artichokes that are firm and heavy for their size. Most do not have a fuzzy choke. Bend back lower, outer petals of artichokes until they snap off easily near base. Continue doing this until you reach a point where the leaves are half green (at the top) and half yellow (at the bottom). Using a sharp stainless steel knife, cut off top third of artichokes or just below the green tips of the petals. Pare all remaining dark green areas from bases. Cut off stems. Halve or quarter as desired. If center petals are purple or pink remove center petals and fuzzy centers. Dip or rub all surfaces with lemon juice. Preparing fresh artichokes for cooking can be intimidating. Luckily, preserved versions of this spring vegetable are just as delicious. 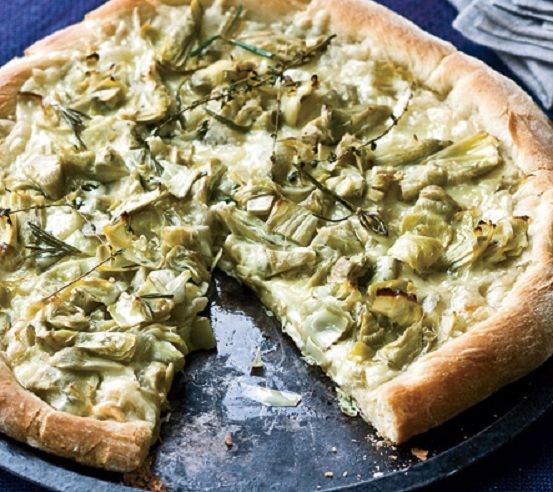 Here are a few ways to use artichokes, whether fresh, jarred or frozen. Whole. Steaming whole artichokes to serve with butter or mayonnaise mixed with capers, lemon and smoked paprika. Or, stuff them with your favorite stuffing mix. Sauteed. When cooked, the leaves on trimmed fresh artichokes fan out and get crisp. Grilled. Boil trimmed artichokes until tender, then finish them on the grill to give them a smoky flavor. Pasta sauce. Simmer oil-packed artichokes in cream, then puree for a luxurious pasta sauce. Bread pudding. Layer marinated artichokes with sourdough cubes and cheese, then cover with eggs and milk and bake for a savory brunch dish. Dip. Instead of the usual cream cheese base, use Greek yogurt and silken tofu in a healthy version of creamy artichoke dip. Involtini. Roll up marinated artichoke hearts with celery leaves in smoked salmon for a super healthy hors d’oeuvres. Pizza. Marinate frozen artichoke hearts in herbed olive oil and add them to a white pizza or a pizza with the works. 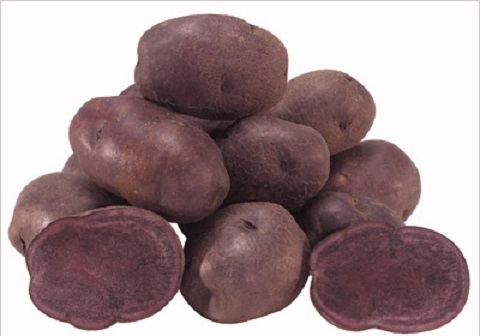 If the potatoes are young and thin skinned, wash and rub them with a rough cloth. Otherwise, peel them and cut in half. Trim the tough outer leaves off the artichokes, cut the tops off (perpendicular to the length of the artichoke) and cut them into eighths, putting the slices into water acidulated with lemon juice to keep them from turning black. When you have finished cutting them up, pat them dry and sauté them in a large skillet with a cover with the oil, garlic, salt and minced parsley. Begin over a low heat, covered, and after a little while uncover them and turn them often so they cook well on all sides, browning and almost coming apart. Remove the artichokes with a slotted spoon to another bowl and set aside. Add the potatoes with a half cup of water to the skillet. Let them cook gently at first, covering the pot so that they soften, and then raise the heat and uncover them to brown them. Once the potatoes have browned, add the artichokes together with salt and pepper to taste, and simmer for about ten minutes over a very low flame. Prepare the Lemon Vinaigrette; set aside until ready to use. Bend back lower, outer petals of the artichokes until they snap off easily near the base. Continue doing this until you reach a point where the leaves are half green (at the top) and half yellow (at the bottom). 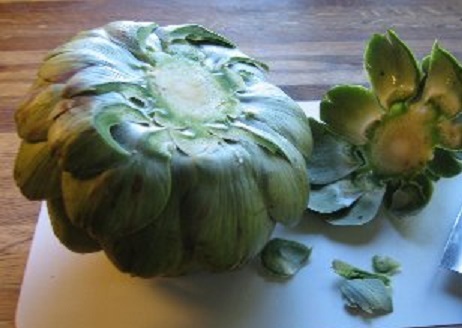 Using a sharp stainless steel knife, cut off top third of artichokes or just below the green tips of the petals. Pare all remaining dark green areas from bases. Cut off stems. In a large saucepan, bring 1 1/2 quarts of water to a boil. Add prepared baby artichokes and cook approximately 7 to 10 minutes or until you can easily pierce them with a fork, but they still offer some resistance. Drain and immediately and immerse in cold water to stop the cooking. When cool, cut the baby artichokes in half lengthwise, sprinkle them with olive oil and salt and pepper to taste. Prepare an outdoor grill. Place the artichokes cut side down on oiled grill grates, cover with the grill lid, and cook over a medium-hot fire, for about 5 minutes, or until the cut sides are well browned. 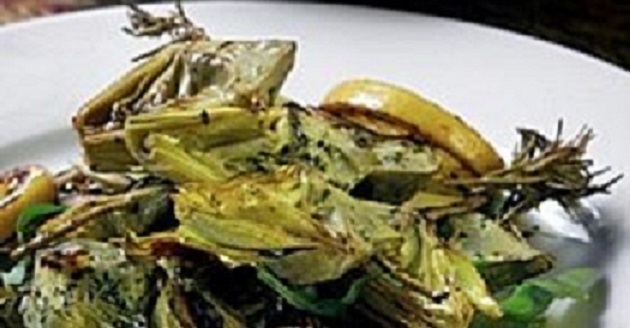 Remove the artichokes to a bowl and pour the Lemon Vinaigrette over the grilled artichokes and toss. This can be served right away, but it is much better to let them sit for an hour or so in the vinaigrette for the flavors to mingle. They will keep, covered and refrigerated, for about 3 days. . In a small bowl, combine lemon juice, Dijon mustard, olive oil, olives and pepper. Whisk together well. This is one of our favorite pizzas. Since I use convenient frozen artichoke hearts, this recipe can be made any time of the year. In a large skillet, combine the artichoke hearts with the olive oil, the lemon juice, garlic and thyme leaves. Season with salt. Cook until the artichokes are soft, about 10 minutes. Set aside to cool. Preheat the oven to 450° F. Dust a pizza pan with cornmeal and stretch dough to fit the pan. Spread the ricotta cheese over the dough and sprinkle the fontina and mozzarella cheese over the ricotta. Distribute the cooked artichoke hearts and sauce over the cheese. Season with salt and pepper and place the pizza to the oven. Bake for about 20 minutes, until the edges are browned. Serve hot. This is my favorite way to stuff artichokes. Fill a bowl with water and squeeze juice from the lemon into the water and reserve the lemon shell. Cut off the artichoke stems, peel them with a vegetable peeler, rub them all over with lemon shell (this prevents browning) and drop them into the lemon water. 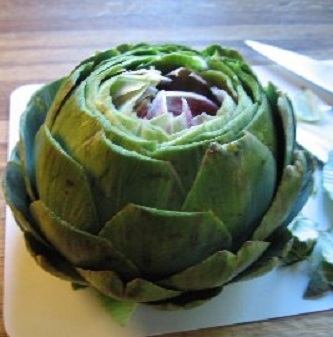 Use a heavy, sharp stainless steel knife to cut the top 1 1/2 inches off an artichoke. Pull out pale inner leaves from center. At the bottom, where leaves were, is a furry bed, the choke. Use a spoon to scoop out the choke. Next, using kitchen shears or a pair of scissors, trim pointy ends from outer leaves of artichoke. As you work, rub the lemon shell over cut parts of artichoke. When you are finished trimming, drop the artichoke into the bowl of lemon water. Repeat with remaining artichokes. In a large bowl combine the panko crumbs, Parmesan, chopped parsley, rosemary, half the garlic, capers, ½ teaspoon salt and pepper. Toss. 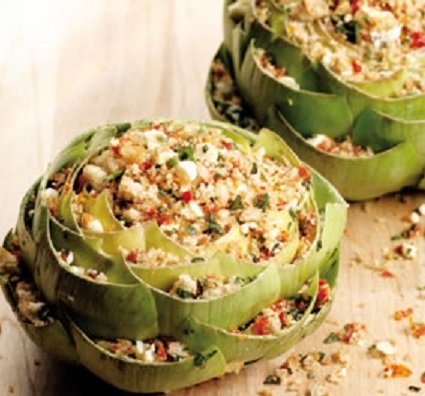 In a small roasting pan or baking dish large enough to hold the artichokes, scatter onion slices, artichoke stems, parsley sprigs and remaining garlic. Holding artichokes over the stuffing bowl, stuff each choke cavity and in between the leaves with the bread crumb mixture. Stand stuffed artichokes upright in the baking dish and generously drizzle olive oil over the center of each artichoke. Fill the baking dish with water until it reaches 1/4 of the way up the artichokes. Add wine and remaining salt to the water. Cover pan with foil and poke several holes in the foil. Bake artichokes for about 1 1/2 hours, or until tender; when done, a knife should be easily inserted into the artichoke and a leaf should be easily pulled out. Squeeze juice from 1 lemon; cut the remaining lemon crosswise into very thin slices. Put onion, fennel, artichokes, coriander, reserved lemon juice and lemon slices, 3/4 teaspoons salt, 4 tablespoons water and 2 tablespoons olive oil into a large saute pan. Cover pan. Bring to a boil. Reduce heat and gently simmer, stirring occasionally, until artichokes are tender, about 15 minutes. Remove to a bowl. Set aside. Combine flour with remaining salt and 1/4 teaspoon pepper. Dredge fish in flour. In the same pan heat the remaining tablespoon oil over high heat until very hot but not smoking. Add fillets. Reduce heat to medium-high and cook fillets, without moving them, until the bottoms are golden brown, about 4 minutes. Carefully turn the fish and cook until fish is opaque and flakes easily, 2 to 3 minutes more. Return artichoke mixture to the pan and warm a minute or two. 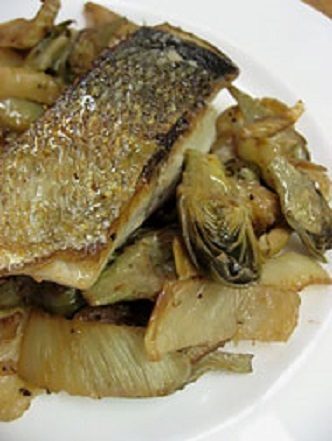 To serve: spoon 1/2 cup of the artichoke mixture onto each serving plate and top with a fish fillet. Garnish with basil. This year marks the 200th anniversary of the birth of one of the greatest Italian composers of all time. Giuseppe Verdi was responsible for some of the best operas, which are still widely known and revered today: La Traviata, Aida and Rigoletto, to name just a few. Verdi dominated the Italian opera scene after the eras of Bellini, Donizetti and Rossini. His works are frequently performed in opera houses throughout the world and some of his themes have long since taken root in popular culture. 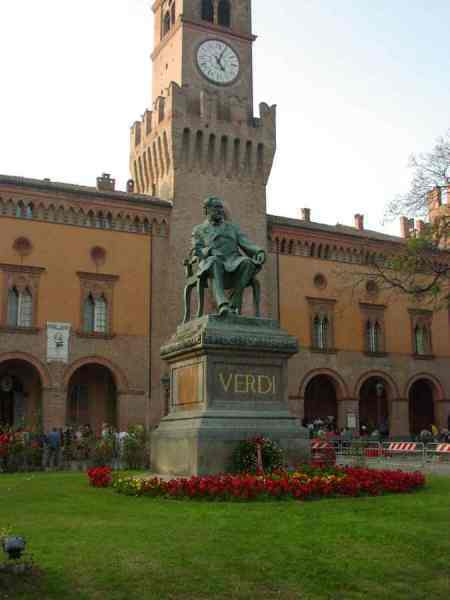 Verdi was born to Carlo Giuseppe Verdi and Luigia Uttini in Le Roncole, a village in the province of Parma (Emilia-Romagna region) in Northern Italy. When he was still a child, Verdi’s parents moved from Le Roncole to a nearby village, Busseto, where the future composer’s education was greatly facilitated by visits to the large library belonging to the local Jesuit school. It was in Busseto that he was given his first lessons in composition. Verdi went to Milan when he was twenty to continue his studies. He took private lessons in music and voice while attending operatic performances and concerts. Eventually, he decided to pursue a career in theater composition. After his studies, Verdi returned to Busseto, where he became the town music master and gave his first public performance at the home of Antonio Barezzi, a local merchant and music lover who had long supported Verdi’s musical ambitions. Because he loved Verdi’s music, Barezzi invited Verdi to be his daughter Margherita’s music teacher and the two soon fell deeply in love. They were married in May 1836 and Margherita gave birth to two children. Unfortunately, both died in infancy while Verdi was working on his first opera and, shortly afterwards, Margherita died of encephalitis at the age of 26. Verdi adored his wife and children and was devastated by their deaths. His first opera, Oberto, performed at La Scala in November 1839, was successful and La Scala’s impresario, Bartolomeo Merelli, offered Verdi a contract for three more works. It was while he was working on his second opera, Un giorno di regno, that Verdi’s wife died. The opera was a failure and he fell into despair, vowing to give up musical composition forever. However, Merelli persuaded him to write Nabucco and its opening performance in March 1842 made Verdi famous. It follows the plight of the Jews as they are assaulted, conquered and subsequently exiled from their homeland by the Babylonian King Nabucco. The historical events are used as background for a romantic and political plot. 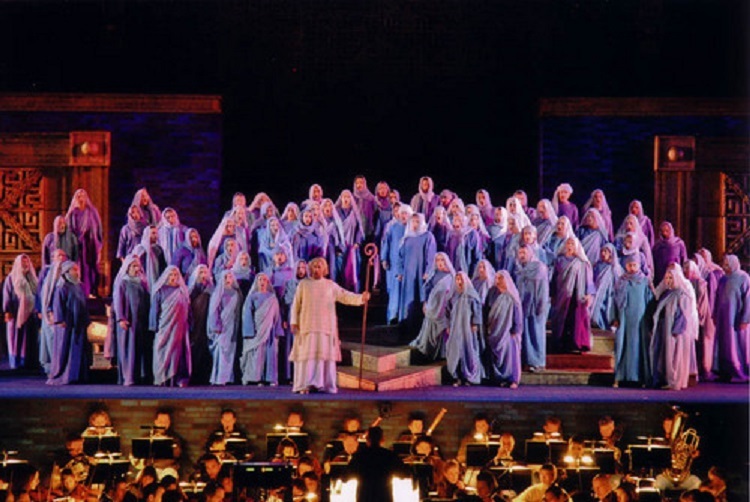 The best-known piece from the opera is the “Chorus of the Hebrew Slaves”. A period of hard work – producing 14 operas – followed in the next fifteen years. These included I Lombardi in 1843, Ernani in 1844 and, for some, the most original and important opera that Verdi wrote, Macbeth (1847). It was Verdi’s first attempt to write an opera without a love story, breaking a basic convention of 19th-century Italian opera. Sometime in the mid-1840s, Verdi “formed a lasting attachment to the soprano Giuseppina Strepponi who was to become his lifelong companion”. Their cohabitation before marriage was regarded as scandalous in some of the places they lived and eventually Verdi and Giuseppina married. 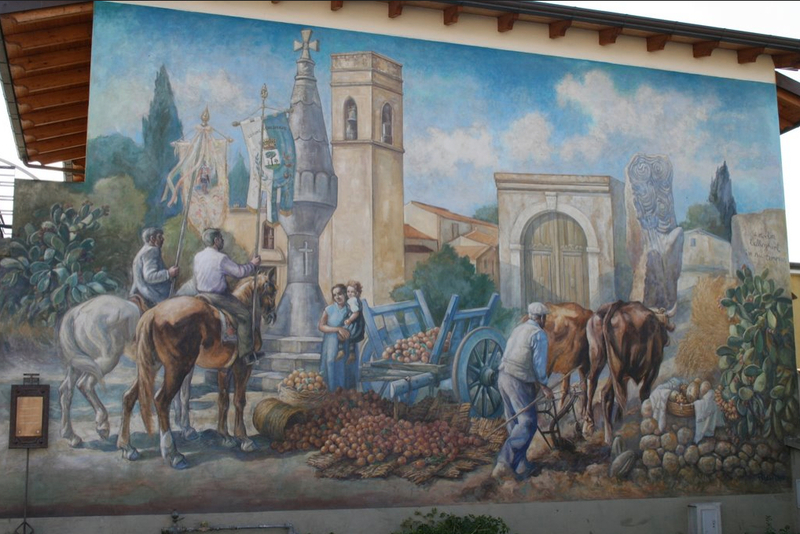 In 1848, Verdi bought an estate two miles from Busseto. Initially, his parents lived there, but after his mother’s death in 1851, he made the Villa Verdi at Sant’Agata his home, which it remained until his death. During this time, Verdi created one of his greatest masterpieces, Rigoletto, which premiered in Venice in 1851. Based on a play by Victor Hugo (Le roi s’amuse), the opera quickly became a great success. There followed the second and third of the three major operas of Verdi’s “middle period”: in 1853 Il trovatore was produced in Rome and La traviata in Venice. The latter was based on Alexandre Dumas’ play, The Lady of the Camellias, and became the most popular of all of Verdi’s operas worldwide. You can listen to the drinking song, “Brindisi” from La Traviata, in the video below performed by two of my favorite opera singers, Dame Joan Sutherland and Luciano Pavarotti. In 1869, Verdi was asked to compose a section for a requiem mass in memory of Gioachino Rossini, as part of a collection of sections composed by other Italian contemporaries of Rossini. The requiem was compiled and completed, but was cancelled at the last minute. Five years later, Verdi reworked his “Libera Me” section of the Rossini Requiem and made it a part of his Requiem Mass, honoring the famous novelist and poet Alessandro Manzoni, who had died in 1873. The complete Requiem was first performed at the cathedral in Milan in May 1874. Verdi’s grand opera, Aida, is sometimes thought to have been commissioned for the celebration of the opening of the Suez Canal in 1869 and there had been a plan to inaugurate an opera house as part of the canal opening festivities, but Verdi turned down an invitation to write an “ode” for the new opera house. In 1869, the organizers approached Verdi (this time with the idea of writing an opera), but he again turned them down. When they warned him that they would engage the services of Charles Gounod and Richard Wagner, Verdi began to show considerable interest and agreements were signed in June, 1870. Teresa Stolz was associated with both Aida and the Requiem, as well as, a number of other Verdi roles. 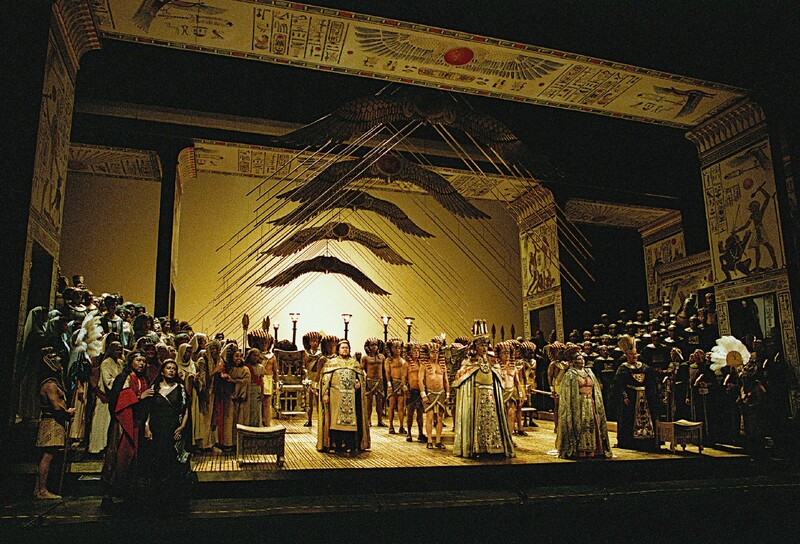 The role of Aida was written for her and she performed the opera at the European premiere in Milan in February 1872. She was also the soprano soloist in the first and in many later performances of the Requiem. After Giuseppina Strepponi’s death, Teresa Stolz became a close companion of Verdi until his death. 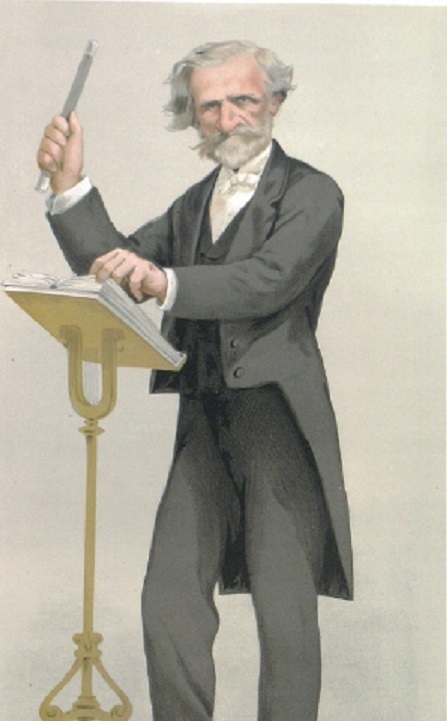 In 1879 the composer-poet Boito and the publisher Ricordi pleaded with Verdi to write another opera. He worked slowly on it, being occupied with revisions of earlier operas, and completed the opera seven years later. This opera, Othello, his most powerful and tragic work, a study in evil and jealousy, is notable for the increasing richness of detail in the orchestral writing. 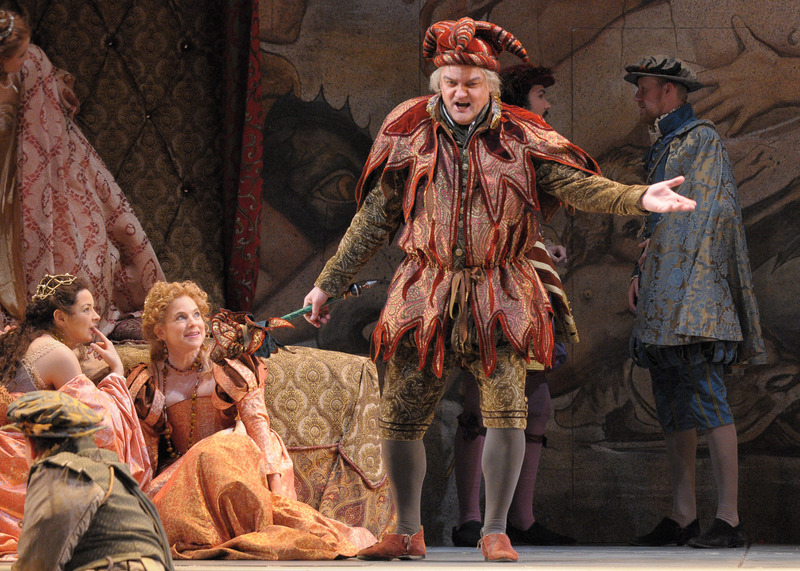 Verdi’s last opera, Falstaff, whose libretto was also by Boito, was based on Shakespeare’s Merry Wives of Windsor and Henry IV, Part 1 with Victor Hugo’s translation. It was an international success and is famous for being one of the world’s best comic operas. While staying at the Grand Hotel et de Milan, Verdi suffered a stroke on January 21, 1901. He gradually grew more feeble and died nearly a week later. Arturo Toscanini conducted a combined orchestra and choir composed of musicians from throughout Italy at Verdi’s funeral service in Milan. To date, it remains the largest public assembly of any event in the history of Italy. Completing 25 operas throughout his career, Verdi continues to be regarded as one of the greatest composers in history. His works are noted for their emotional intensity, tuneful melodies and dramatic characterizations. He transformed the Italian opera, with its traditional staging, old-fashioned librettos and emphasis on vocal displays, into a unified musical and dramatic entity. As Verdi matured he played with the expectations of listeners, who expected scenes to unfold in familiar patterns. Instead, he would break off an aria and transition into a charged recitative or blur distinctions between forms and styles to make the music responsive to the dramatic moment and the text. The music of Verdi, one of Italy’s most outstanding composers, makes up some of classical music’s most timeless treasures and his operas are among those most frequently produced in the world today. 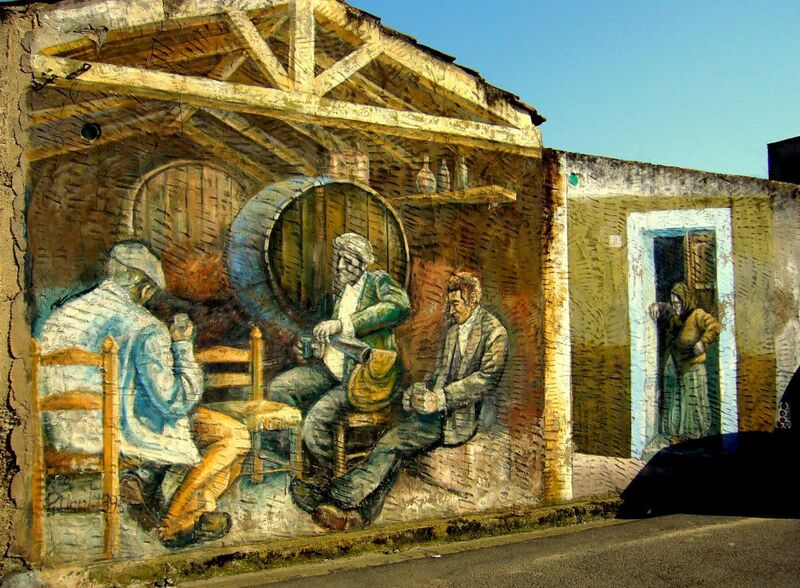 Verdi lived in Busetto in the heart of the Italian province of Parma, in Emilia-Romagna. When one thinks of luxurious Italian food, it is usually classic Emilia Romagna cuisine. The area is known for its flavorful produce dishes. Bright green asparagus is served with Parmigiano Reggiano and melted butter. The sweet chestnut, known as Marrone di Castel Rio, comes from Emilia Romagna, as do porcini mushrooms. Local shallots and olive oil pressed from local olives are prized for their quality. Pasta is a favorite food in the region. While polenta, rice and gnocchi were staples in Emilia Romagna cooking, fresh egg pasta is now more popular. 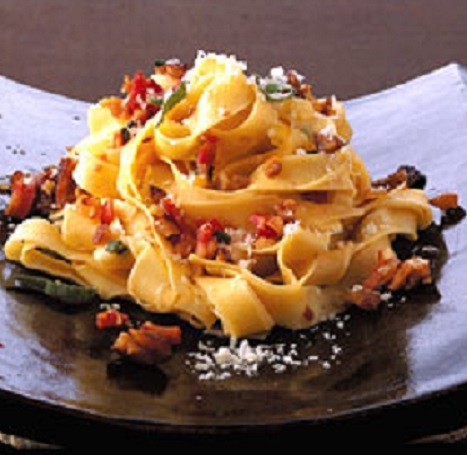 Most areas consider tagliatelle their favorite shape and serve it with ragù. Recipes also include tortelli, or large pasta squares, filled with ricotta and greens and served with melted butter. In addition to the Romagnola breed of cattle, rabbit, game birds and poultry are eaten. Wild duck and tomatoes are stewed with herbs, white wine and served with risotto. 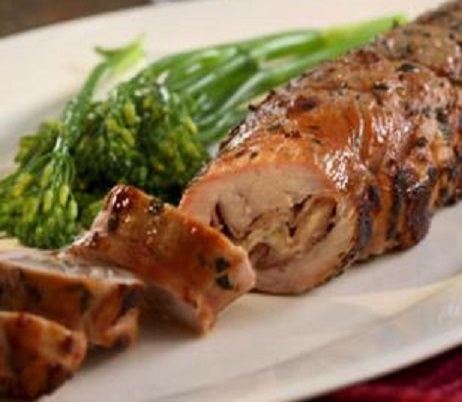 Cappone ripieno, or roasted capon, is stuffed with with a marsala flavored veal and ham filling. Other popular meats include pork, lamb and mutton. Proscuitto di Parma and fresh fruit are served together for a refreshing appetizer. Emilia is well known for Parmigiano Reggiano, but the Grana Padano and Provonole Valpadana are also extremely high quality. Cheeses are used young, while sweet, or aged to develop a sharper flavor for grating. Ravaggiolo and squaquarone are also creamy piquant cheeses used in cooking. After so many rich dishes, it’s appropriate that many Emilia Romagna desserts are based on fresh fruit. Melons, stone fruits, berries and pears are most often served. You can use any seafood to top the polenta. The same combination may be successfully used in bruschetta or crostini recipes. Cook the polenta in salted water with the olive oil, in proportions according to package directions. You want a thick polenta, not thin. Pour the polenta into a loaf pan and leave it to set overnight; or for at least two hours. The next day, cut the loaf into slices. 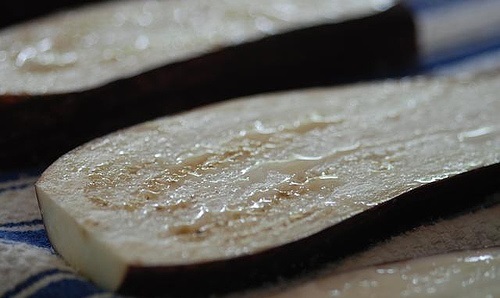 Place the slices on a wooden board and brush with some olive oil. Next arrange the slices, oiled side down, on a greased oven rack. Brush the other side with olive oil. Bake in 200°C/390°F oven until golden brown on top, for about 30 minutes. Then remove from the oven; let it cool. Meanwhile prepare the mussels and sauces. In a skillet heat the olive oil; add chopped garlic and the mussels. Then add the wine and let it cook until all liquids evaporate. Heat the olive oil in a saucepan; add chopped onion and sauté until golden. Next add chopped garlic. Stir and sauté briefly, then add the canned tomatoes. Lower the heat and cook until the liquid evaporates and the sauce thickens. Remove from heat and let the sauce cool slightly. Then place it in a food processor and blend with a small bunch of fresh basil, salt and pepper. Place all ingredients for the sauce in a food processor. Blend until fairly smooth. 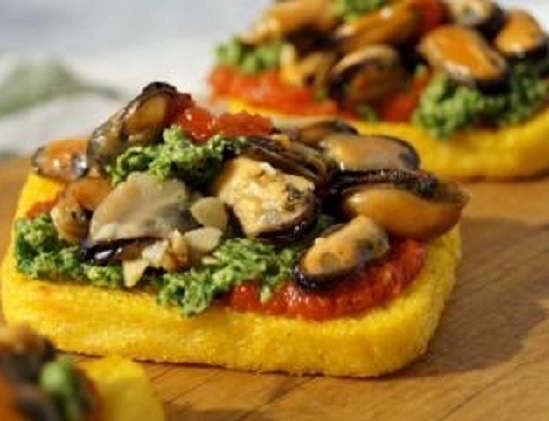 Carefully remove the polenta slices from the rack and arrange on a serving platter. Top with the tomato sauce and green sauce. Then arrange the mussels on top. Serve warm. Cook pancetta in oil in a 12-inch heavy skillet over moderate heat, stirring frequently, until beginning to brown, 3 to 4 minutes. Add onion and cook, stirring frequently, 2 to 3 minutes. Add garlic, 1 tablespoon sage and cook, stirring, 1 minute. Stir in chestnuts and remove from heat. Cook pasta in a 6- to 8-quart pot of boiling salted water according to package directions. Reserve 1 cup of pasta cooking water, then drain pasta in a colander and add to the pancetta mixture in the skillet. Add the reserved cooking water along withthe cheese and butter and cook, tossing constantly, over high heat until pasta is well coated, about 1 minute. Add salt and pepper to taste and serve sprinkled with parsley and remaining tablespoon sage. Serve with broccoli rabe. Try to purchase authentic Italian Prosciutto di Parma and Parmigiano-Reggiano for this dish—even though it is more costly, the superior flavor is worth the expense. Combine sage, garlic, rosemary, salt and pepper in a small bowl. Set aside. Butterfly the tenderloins, so they can be flattened, stuffed and rolled. To do that, make two long horizontal cuts, one on each side, dividing the tenderloin in thirds without cutting all the way through. Working with one tenderloin at a time, lay it on a cutting board. Holding the knife blade flat, so it’s parallel to the board, make a lengthwise cut into the side of the tenderloin one-third of the way down from the top, stopping short of the opposite edge so that the flaps remain attached. Rotate the tenderloin 180°. Still holding the knife parallel to the cutting board, make a lengthwise cut into the side opposite the original cut, starting two-thirds of the way down from the top of the tenderloin and taking care not to cut all the way through. Open up the 2 cuts so you have a large rectangle of meat. Use the heel of your hand to gently flatten the meat to about 1/2 inch thick. Cover each butterflied tenderloin with 2 of the prosciutto slices, then spread 1/2 cup Parmigiano-Reggiano over the ham, leaving a 1-inch border. Starting with a long side, roll up each tenderloin so the stuffing is in a spiral pattern; then tie the roasts at 2-inch intervals with kitchen string. Lightly brush the roasts all over with 1 1/2 teaspoons oil, then rub with the reserved herb mixture. Heat the remaining 1 1/2 teaspoons oil in a large, heavy, ovenproof skillet over medium-high heat. Add the roasts, bending to fit if necessary, and cook, turning often, until the outsides are browned, 3 to 5 minutes total. Transfer the pan to the oven and roast, checking often, until the internal temperature reaches 145°F, 15 to 20 minutes. Transfer to a cutting board, tent with foil and let rest for 5 minutes. To serve, remove the string and cut the pork into 1-inch-thick slices. Whether it’s a partner or a family member with different eating styles and preferences, conflict can arise on various fronts when some people in the house are vegetarians and others are not. The good news: with a little patience and compromise, not to mention good humor, it is possible for everyone to enjoy meals together. Setting ground rules in advance can ward off many disagreements in the kitchen. In particular, deciding who is responsible for what can help prevent resentment and ensure things run more smoothly when it comes time for food preparation. Will a group meal be prepared that everyone will share? How does the vegetarian feel about preparing and cooking meat even if he or she doesn’t eat it? Will the non-vegetarian prepare vegetarian meals? Is it simplest for each person to be responsible for their own cooking? The non-vegetarian partner should agree to expand his/her food horizons and try new vegetables, grains and protein sources. Find as many dishes as possible that also work for your partner. The vegetarian partner should tolerate having the non-vegetarian cook meat, chicken or fish in the family kitchen. Have pots and dishes just for that, if it’s an issue. 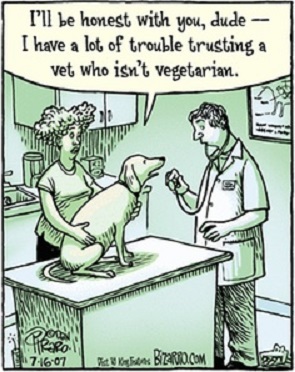 At the same time, the vegetarian shouldn’t be expected to cook meat, unless he/she doesn’t mind. Freeze individual portions of each partner’s favorite dishes to eat when time is short or you can’t agree. Never make negative remarks about what the other wants to eat. Don’t try to convert the other to your point of view or even think that this would be a good thing. It never is. 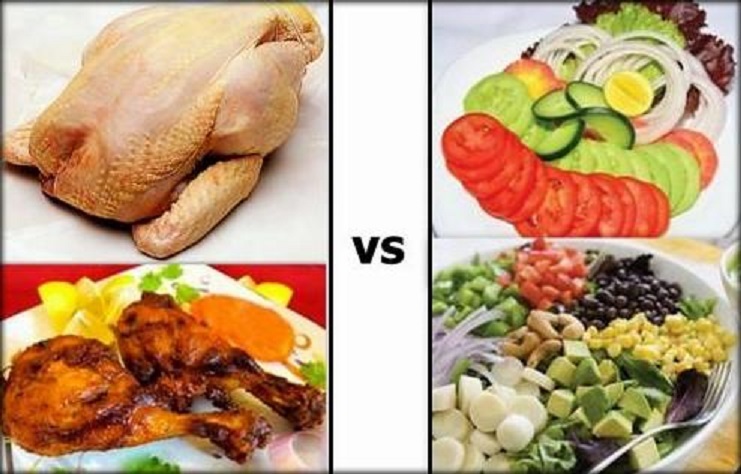 A vegetarian eats no meat, poultry or fish. An ovo-lacto vegetarian eats eggs and milk. A lacto-vegetarian eats dairy products, but not eggs. A vegan eats no animal products at all, often including honey. There are strict ethical vegans who don’t wear or use any animal product. Raw food devotees are vegan. A pesco-vegetarian (eats fish) isn’t vegetarian, because fish is considered an animal product. Flexitarian is a made up term for one who flips back and forth from vegetarian to non-vegetarian. When entertaining think about the likely food preferences of those you’re feeding. Ask about likes and dislikes, as you would with any other guest. Stick with familiar foods, when feeding both vegetarians and non-vegetarians at the same meal. Serve egg or cheese based dishes, such as a Spinach Quiche. Good accompanied with baked potato and a salad. Chickpeas and kidney beans are familiar enough to be used in small amounts. Add them to dishes that are well-known – such as three-bean salad, pasta salad, minestrone soup or vegetarian chili. Use familiar comfort foods, such as potatoes, breads or pasta. Familiar ethnic foods work well: Mexican, Indian or Italian. Whenever possible, tell your guests in advance what you’re planning to make and ask them for suggestions, if you feel comfortable with that idea. Breakfast may be one of the easier meals to accommodate vegetarians and non-vegetarians, so inviting friends for brunch may be an ideal way to entertain. There are many breakfast options that do not contain meat, such as oatmeal, yogurt, granola, fruit, coffee cake, pancakes or waffles that can be enjoyed by both vegetarians and non-vegetarians. For a larger breakfast, eggs or omelets can be eaten by everyone, except vegans. For the non-vegetarians, bacon or sausage can easily be added to the meal as a side. For vegetarians, sandwiches made with vegetables and cheese can provide an alternative to deli meats, while non-vegetarians can add sliced turkey, beef or chicken to their sandwiches. Soups can be made with vegetable broth instead of chicken or beef broth. 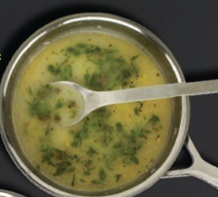 Cooked chicken, fish or beef can be added to the non-vegetarian soup just before serving. Salads are also lunch options that are easy to make vegetarian by replacing meat or fish with beans or hard-boiled eggs. Dinner pasta or rice recipes made with vegetables are easily prepared dishes where meat or fish can be added for family members that are not vegetarians. The situation in my family is easy. The vegetarians are not vegan. They just do not eat animal protein and they don’t get upset if it is on the table. My typical approach is that I make the same foods the non-vegetarians are eating minus the animal protein part for the vegetarians. It is a two-in-one system. Two versions of the same dish, one vegetarian and one non-vegetarian. Here are some of the recipes that work in our family. Corn chowder is another great option. Serve crumbled bacon on the side as a garnish. Sauté the onion, celery and carrot in olive oil in a Dutch oven for about 10 minutes, until the onions translucent. Add the potato, garlic and rosemary and sauté for another 5 minutes. Add the split peas, vegetable stock, salt and pepper and bring to a boil. Lower heat and cook, partially covered, for another 40 minutes or so until the peas are very soft and falling apart. 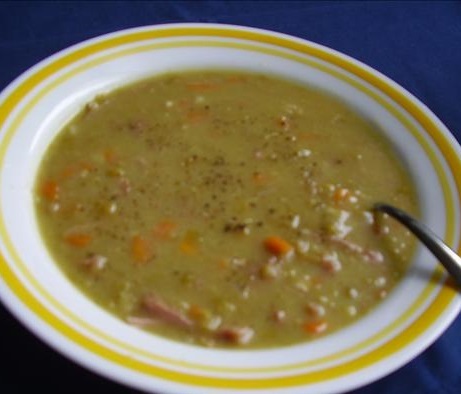 Serve the warmed ham in a separate bowl for non-vegetarians to add to their soup bowls. Combine water, rice and 1 teaspoon oil in a medium saucepan; bring to a boil. Reduce heat to maintain the barest simmer, cover and cook until the water is absorbed and the rice is just tender, 40 to 50 minutes. Transfer to a large bowl and set aside. Half fill a large pot with water and bring to a boil. Line a baking sheet with a clean kitchen towel and place near the stove. 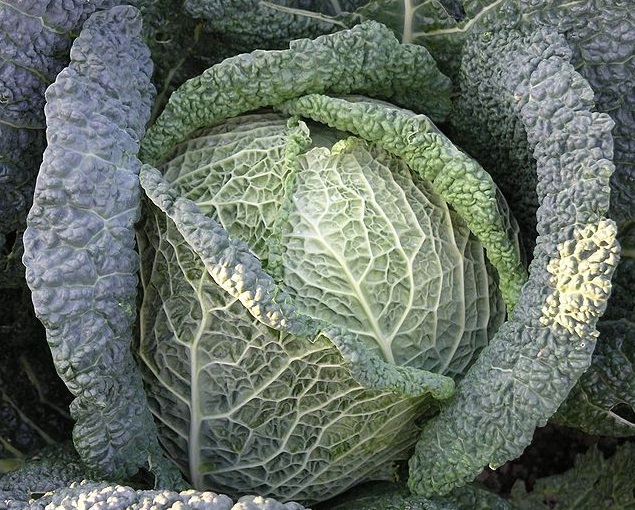 Using a small, sharp knife, remove the core from the bottom of the cabbage. Add the whole cabbage to the boiling water and cook for 5 minutes. As the leaves soften, use tongs to gently remove 8 large outer leaves. Transfer the leaves to the toel lined baking sheet and pat with more towels to thoroughly dry. Set aside. Heat 1 tablespoon oil in a large skillet over medium-high heat. Add mushrooms, onion, garlic, sage, rosemary and 1/4 teaspoon each salt and pepper; cook, stirring, until the mushrooms have released their juices and the pan is fairly dry, 8 to 10 minutes. Add wine and cook, stirring, until evaporated, about 3 minutes more. Add the mushroom mixture to the cooked rice along with currants and pine nuts. Heat the remaining tablespoon of oil in the same skillet over medium-high. Add the chopped cabbage, the remaining salt and pepper; cook, stirring, until the cabbage is wilted and just beginning to brown, 3 to 5 minutes. Set aside in a separate bowl. Add the sausage to the empty skillet and brown. Set aside in a separate bowl. Heat 1 tablespoon oil in a large saucepan over medium heat. Add onion, garlic, salt and pepper and cook, stirring, until starting to soften, 2 to 4 minutes. Add tomatoes and wine; bring to a simmer and cook until slightly thickened, about 10 minutes. Coat two 8-inch baking dishes with olive oil cooking spray. Place a ½ cup of tomato sauce in each baking dish. Divide the rice mixture in half. To one half add the sautéed cabbage and to the other half add the browned sausage. Place a reserved cabbage leaf on a cutting board; cut out the thick stem in the center, keeping the leaf intact. Repeat with three more cabbage leaves. Evenly divide the cabbage/ rice mixture among the four leaves. Fold both sides of the cabbage over the filling and roll up. Repeat with the remaining 3 leaves and filling. 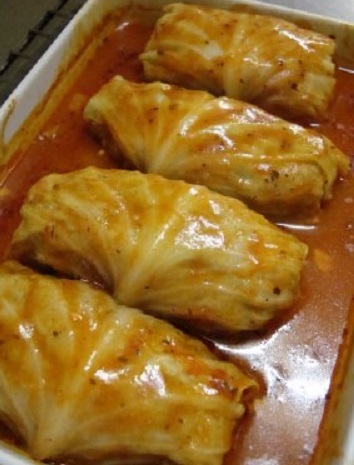 Place the stuffed cabbage rolls, seam side down in one baking dish. Evenly divide the sausage/ rice mixture among the four leaves. Fold both sides of the cabbage over the filling and roll up. Repeat with the remaining 3 leaves and filling. Place the stuffed cabbage rolls, seam side down in the other baking dish. Pour the remaining sauce evenly over the rolls in both pans. Drizzle a little olive oil over the top of the cabbage rolls in each pan. Sprinkle the chopped parsley over the tops of the vegetarian rolls, so you will know they are the vegetarian rolls when serving. Bake, uncovered, basting twice with the sauce, until hot, about 45 minutes. Heat oil with the butter over medium heat in the same pan. Add carrots, zucchini, leeks and garlic, season with salt and white pepper and sauté until tender, 6-7 minutes. Sprinkle veggies with flour and stir a minute more. Deglaze the pan with the wine, then stir in 2 cups of the vegetable broth. Cook until the sauce thickens. Stir in the peas and reduce the heat to low. Bring a pot of water to a boil for the pasta. Add salt and cook the pasta to the al dente stage and drain. Add the Primavera sauce to the pasta along with the remaining 1/2 cup vegetable broth. Gremolata-zest the lemon and combine it with the finely chopped herbs. 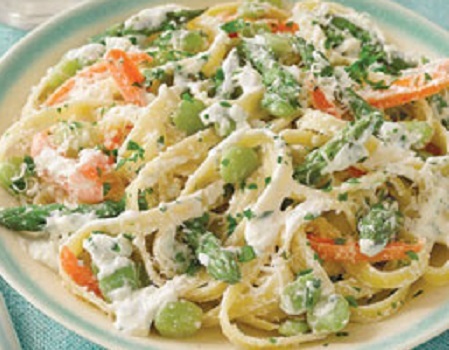 Serve the pasta in shallow bowls topped with some of the gremolata and some grated cheese. Heat the remaining 1/2 cup of chicken poaching broth and pour it over the sliced chicken. Serve the chicken to non-vegetarians to add to their pasta bowl. I like to serve this dish with a brown and wild rice mix and a tomato salad. You can use any combination of vegetables that you like and that your vegetarian friends or family like. Combine glaze ingredients in a large glass measure. Microwave on HIGH 45-60 seconds, stirring once until bubbly. Place the vegetables on one platter, the shrimp on another platter and the beef on another platter. Lightly brush some of the glaze on all sides of the vegetables. 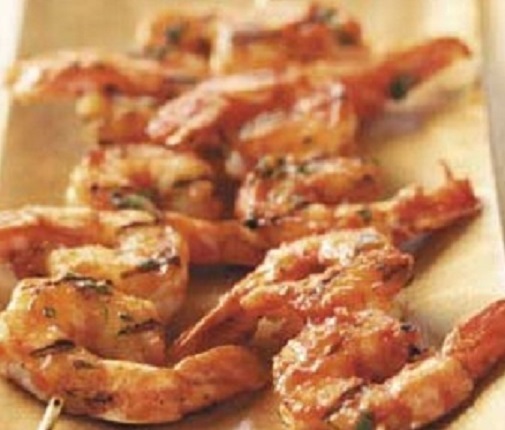 Wash or change to another pastry brush and lightly brush the steak and shrimp with the remaining glaze. Thread vegetables, beef and shrimp, separately, onto 12-inch metal skewers. 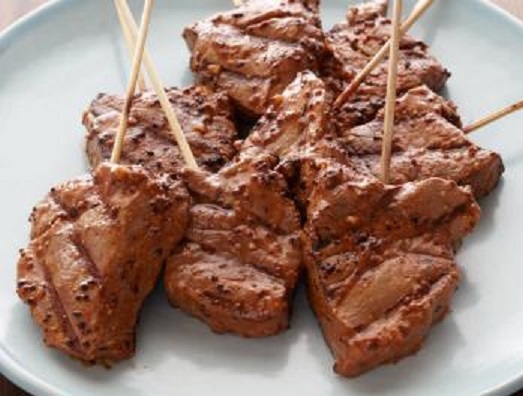 Place beef skewers on the grill over medium heat. Grill steak, 12-15 minutes for medium rare to medium, turning occasionally. 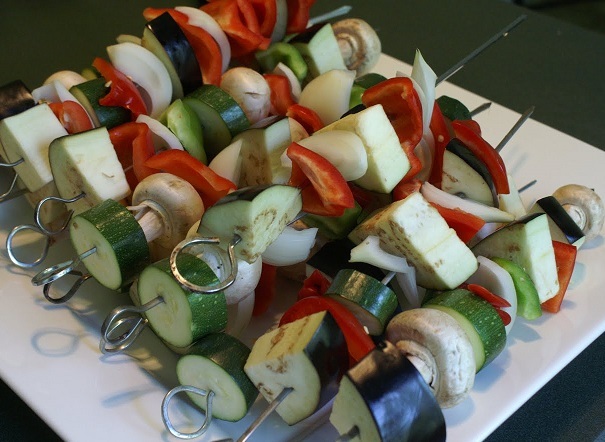 Grill vegetables skewers for 10 minutes or until the vegetables are until tender. Grill the shrimp just until they turn pink, turn and grill until the second side is pink. Serve the grilled vegetables on one platter and the shrimp and beef on another platter. Bored With The Same Old Side Dishes? Are you bored with the same old side dishes for your evening meal? Its time to give your sides an update. The best side dish recipes are those that taste great and are not overshadowed by the main course. However, the same old vegetables cooked the same old way can get boring and go uneaten. Do you find that every salad you make finds you standing at your cutting board chopping your veggies into the same shapes and sizes and then combining them in the same way all the time? Here’s a tip to make your salads and cooked veggies more interesting: change the way you cut! If you always chop your vegetables into cubes, try sticks, grating and shaving or food process your veggies into a grain-like texture. Use spiral cuts for zucchini, carrots, beets or sweet potatoes. Toss them into a salad with your other vegetables. Add a fresh tasting dip, sauce or dressing to a vegetable and you can transform the meal completely. Mastering a variety of dressings, sauces and dips is one of the best ways to avoid boredom. 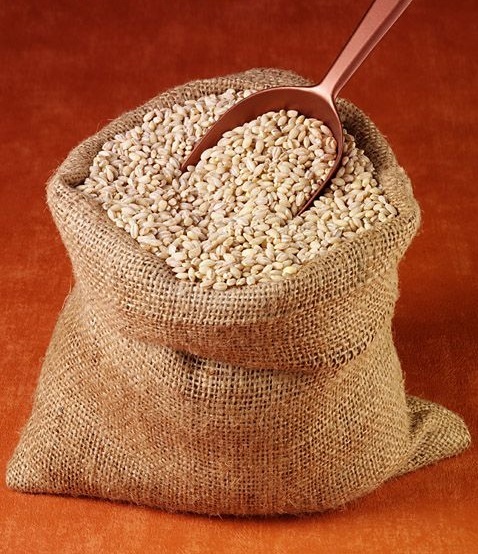 They can be poured over salads, hot cooked vegetables or enjoyed with crudités and whole grain crackers. Place mayonnaise in a small saucepan. Gradually add broth, whisking until smooth. Heat over medium-low, whisking constantly, until warmed through but not bubbling, about 2 minutes. Remove from heat and stir in mustard, oil, lemon juice, parsley, tarragon, chives and pepper. Drizzle the warm sauce over cooked vegetables and garnish with lemon zest. One of the best ways to add variety and interest to your meals is to experiment with ingredients you haven’t used before. 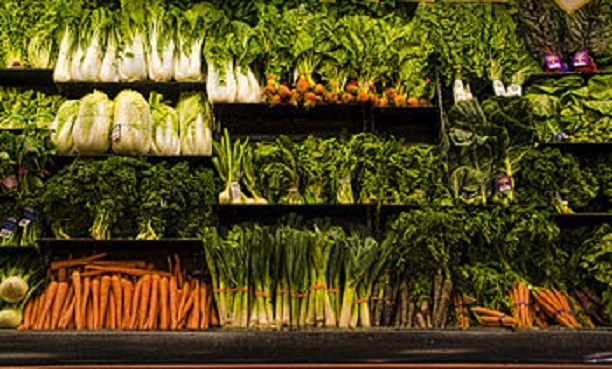 There are so many varieties of fresh fruits and vegetables out there that it just depends on what you have available in your area at any given time of the year. Try going to different markets, grocery stores, gourmet stores and ethnic markets to find produce that you haven’t cooked with before. Asian markets are particularly abundant with exotic fruits and vegetables and you could try a new ingredient every week for months. You can also try new dried spices, dried herbs, oils, nuts, seeds or dried fruits. Keep your eyes open to see what is around and allow your senses and creativity to guide your purchases. Even if you are on a tight budget, you could likely afford to try one new ingredient per week. Not only is eating seasonally better for your health and the planet, but it also means that for the four seasons of the year, you are exposed to and using different ingredients. This really helps to keep things interesting and gives your taste buds a makeover. Adding a different fresh herb or spice to an old recipe can completely change a meal, as does just adding fresh herbs in the first place. A basic mixed greens salad or chopped salad will taste entirely different and far more exotic with some fresh basil, mint, coriander, dill or parsley. Don’t be afraid to try a new herb. The same goes for new spices. Spice blends in particular can be an easy and great new addition to your culinary repertoire. Try a New Recipe and a New Food. Separate the chard leaves from the stems. Wash the stems and chop them into ½-inch pieces; set aside. Tear the leaves into large pieces, wash them thoroughly and spin or pat dry; set aside. Heat the olive oil in a large skillet over medium heat. Add the onion and pancetta and cook, stirring frequently, until the onion is soft and slightly browned, about 7 minutes. 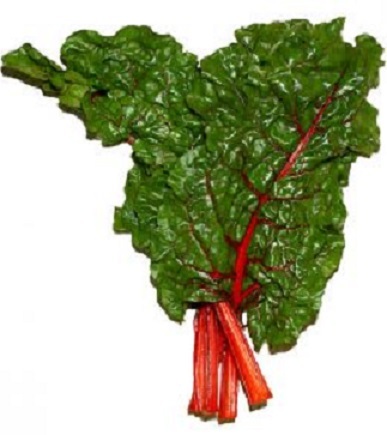 Add the chard stems and cook for 2 to 3 minutes. Stir in the raisins and cook for another 2 to 3 minutes. Add the chicken stock, cover the skillet, and simmer until the stems have softened, 5 to 7 minutes. Add the chard leaves, season lightly with salt and pepper and stir to combine. Cover the skillet and braise for 3 to 4 minutes. When the chard leaves are wilted and most of the liquid has evaporated, it is done. Serve hot or at room temperature. Scrub potatoes with a stiff brush under running water. Cut potatoes in quarters. In a Dutch oven cook potatoes in a small amount of boiling, lightly salted water, covered, for 10 to 15 minutes or until tender. Add beans the last 3 to 5 minutes of cooking. Drain; rinse with cold water until vegetables are cooled. Drain well. In a medium bowl stir together oil, vinegar, rosemary, salt and pepper. Add potato mixture and green onions. Toss mixture gently. Serve warm or at room temperature. Combine the broth and vermouth in a liquid measuring cup and set aside. In a small bowl, whisk together the heavy cream and tomato paste and set aside. Cut the stalks off the fennel bulb. Chop enough of the fennel fronds to yield 1 tablespoon; set aside. Trim the bulb and cut it in half. Remove the core. Cut each fennel half into thin wedges. In a large sauté pan with a lid, heat the olive oil over medium heat. Arrange the fennel wedges in one layer in the pan. Season with salt and pepper. Cook until the wedges are lightly browned, about 6 minutes. Turn the wedges over with tongs. Pour the broth-wine mixture over the fennel. Cover the pan, leaving the lid slightly ajar, so that the steam can escape. Make sure the liquid is gently simmering and cook until the liquid is reduced to just a few tablespoons, 10 to 12 minutes. Remove the lid, add the tomato-cream mixture and cook, gently turning the fennel wedges with tongs until the cream thickens and coats the fennel, about 2 minutes. Remove the pan from the heat. 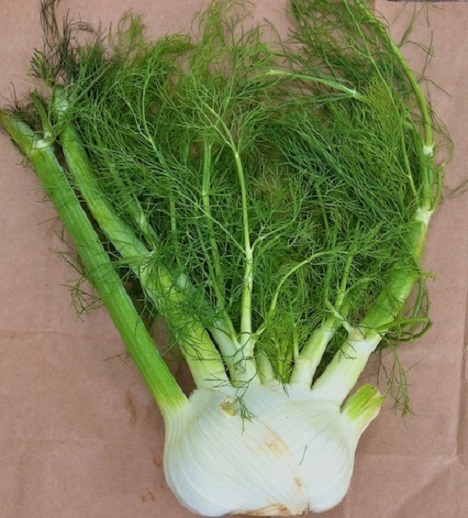 Serve the fennel garnished with the chopped fennel fronds. In a medium saucepan, melt the butter. Add the barley and cook over moderate heat, stirring until toasty brown, about 10 minutes. Add the broth or water and 1 teaspoon of salt and bring to a boil. Cover and cook over low heat until the barley is tender and the water is absorbed, about 20 minutes. In a large deep skillet, bring 1/2 inch of water to a boil. Add the broccoli florets, cover and cook just until bright green, about 2 minutes. Drain and pat dry. Wipe out the skillet and heat the olive oil. Add the shallots, garlic, hot pepper and scallions and stir for 1 minute. Add the broccoli florets, season with salt and cook for 2 minutes, stirring constantly. Off the heat, stir in the barley and serve immediately. 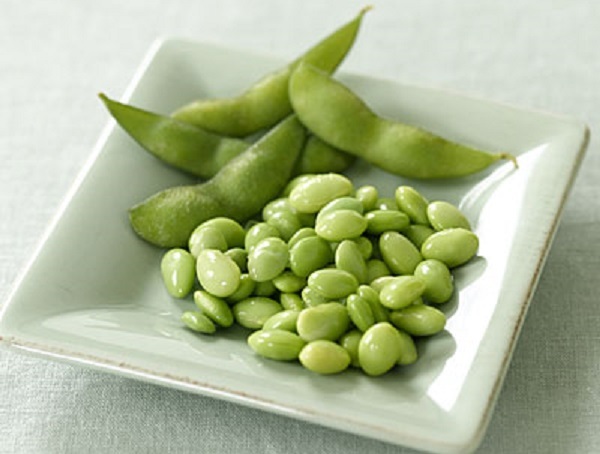 In a large salad bowl combine salad greens, sun-dried tomatoes, edamame and almonds. For dressing, in a small glass measuring cup whisk together lemon juice, oil and black pepper. To serve, pour dressing over salad, toss to coat. Divide salad among six individual salad plates and top each serving with a few shavings of Parmigiano-Reggiano cheese. Remove the core of the cabbage and cut the remaining cabbage into 1/4-inch strips. You should have about 4 firmly packed cups of cabbage strips. Place the olive oil in a large sauté pan or Dutch oven over high heat. Add the onion rings and sauté until they start to soften and brown. Add the cabbage and garlic stirring to blend well. Crush the tomatoes with your hands over the cabbage and add them to the pan. Add the tomato liquid, vinegar and thyme. Season well with salt and lots of freshly ground black pepper. Bring mixture to a boil, reduce heat, and cook, covered, for 30 minutes or until cabbage is softened and flavors are blended. When ready to serve, stir butter into the cabbage. Place on plates and pass the grated Pecorino Romano cheese. Horseradish is native to Eastern and Central Europe and possibly Western Asia. It has been grown for its roots for over 2,000 years. The Oxford Companion to Food notes that the first written mention of the root was probably in the 13th century, when a root with the description of horseradish was mentioned in a text describing medicinal cures. Its use as a condiment came later, based on the earliest known written documentation from the 15th century. The English word “horseradish” has nothing to do with horses or radishes. The word “horse” formerly meant “coarse” or “rough.” “Radish” comes from the Latin “radix,” meaning “root.” Horseradish is not a type of radish, although they are in the same family. In Slovenia and in the Italian regions of Friuli Venezia Giulia and Veneto, horseradish (often grated and mixed with sour cream, vinegar, hard-boiled eggs or apples) is also a traditional Easter dish. Further west in the Italian regions of Lombardy, Emilia-Romagna and Piedmont, it is called “barbaforte (strong beard)” and is a traditional accompaniment to Bollito Misto; while in the Italian northeastern regions of Trentino-Alto Adige/Südtirol, Veneto and Friuli-Venezia Giulia, it is still called “kren” or “cren”. Horseradish is in the Brassica family, which includes broccoli, radishes, kohlrabi, cauliflower and kale. It is a perennial in most locations in the US and will spread rapidly in the garden from season to season, if not contained properly. Horseradish plants have large, deep green, spoon-shaped leaves (which are edible), large, deep-growing roots and very fragrant white flowers. The bulk of US horseradish cultivation is in southwestern Illinois, near the banks of the Mississippi River (near St. Louis), where the root has been grown commercially for over 150 years. Cool weather helps give horseradish its pungency, so it is generally harvested from mid-fall right through to early spring. Horseradish growers employ a wide range of herbicides, including glyphosate (aka RoundUp) to control both weeds and spreading horseradish plants (because horseradish spreads so easily. 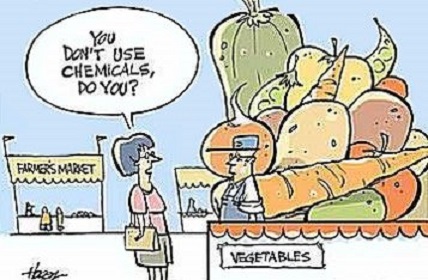 Other pesticides are used to control insect infestations and disease. If you are concerned about pesticide use in horseradish cultivation, look for organic horseradish at your local farmers’ market. 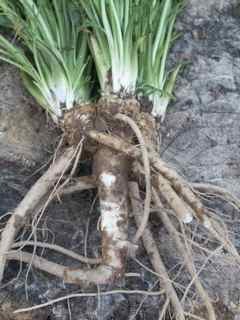 Horseradish roots are large, tapering to a point, with a dark brown peel and a creamy white interior. Horseradish’s bite comes from the release of compounds when the root is grated (without grating and exposure to air, horseradish roots really don’t smell like much of anything). Vinegar stops this chemical process, which is why most commercial horseradish preparations contain vinegar. For really hot horseradish, leave the grated root exposed to the air for a few minutes (longer than that, it starts to discolor and dry out). For milder horseradish, add vinegar right away. Look for firm roots with no mushy or black spots. Avoid roots that are floppy or dried out. 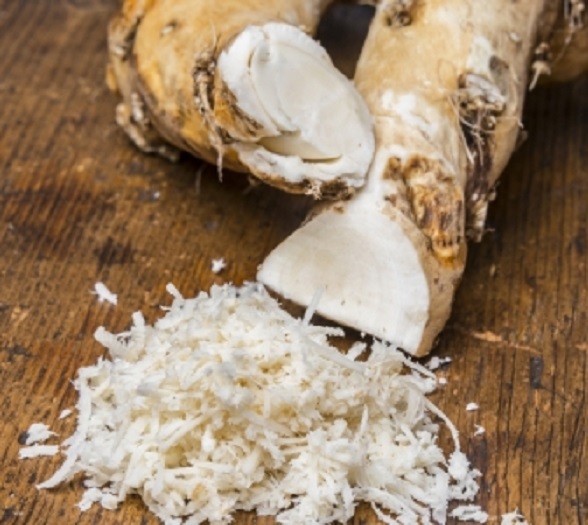 You can find horseradish root in the produce section of some grocery stores and at farmers’ markets. Grated horseradish root makes delicious sauces and condiments. It is perfect paired with beef, seafood and roasted vegetables. You can stir freshly grated root (or prepared horseradish) in to mustard for a spicy sauce or mix it with ketchup to make a cocktail sauce for seafood. Horseradish root is generally not cooked, but grated and mixed with vinegar or other condiments to make sauces. Cooking grated horseradish greatly diminishes the flavor and pungency of the root, so add horseradish at the end of cooking, off the heat. Horseradish root can be used in a number of creative ways in the kitchen. The grated root is commonly mixed with dairy products (like cream, sour cream and crème fraiche) to tame its peppery bite. Also try stirring some horseradish into your next batch of vinaigrette, make a horseradish dip or fold some grated horseradish into mashed potatoes. 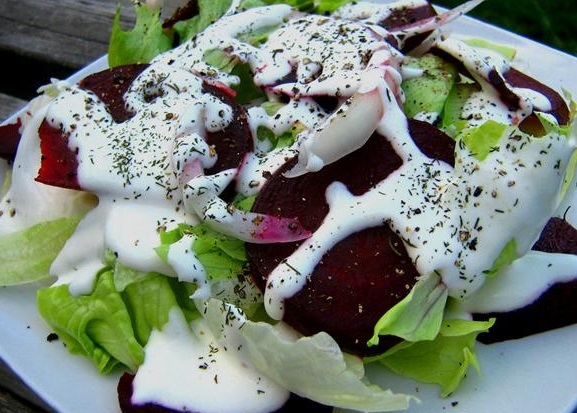 Creamy horseradish sauce is commonly served with roast beef, but is equally good with salmon, scallops, roasted vegetables (especially potatoes and beets) and, of course, stirred into Bloody Mary mixes. Some recipes call for fresh horseradish to be grated in a food processor (convenient if you have a large batch to grind), but a Microplane zester makes the best grated horseradish, if all you need is a tablespoon or two. Many recipes for grating your own horseradish recommend that you do so outdoors or in a very well ventilated place and wear gloves and eye protection. The volatile oils that are released from horseradish that is grated are very pungent. 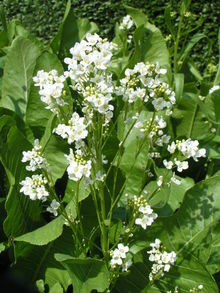 An enzyme found in horseradish, called horseradish peroxidase, is widely used in biochemical research. Horseradish is toxic to horses. Don’t put your horseradish sauce in a silver serving dish: the grated root can tarnish the metal. Horseradish is commonly used as one of the “bitter herbs” required at Passover Seder. Uncut horseradish roots will keep for several weeks in the crisper drawer of the refrigerator. Cut horseradish should be used right away. 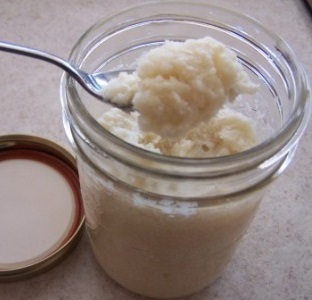 Grated fresh horseradish, preserved in vinegar, will keep for several months in the refrigerator. Peeled and grated horseradish can be stored in sealed bags or containers in the freezer for a few months. Peel and coarsely grate the fresh horseradish root. Combine grated horseradish, 2 tablespoons white wine vinegar and salt in a food processor; pulse 4 or 5 times or until the horseradish begins to break down. Add the remaining vinegar, a tablespoonful at a time, until the mixture forms a coarse paste. Transfer mixture to a jar and refrigerate for up to 1 month. In Trentino, Italy, cooked apples and fresh horseradish are served with roasted beef, chicken or pork dishes. Cream is added to the sauce to temper the sharpness of the horseradish. In a heavy 3 or 4-quart saucepan with a cover, place the apple chunks and toss with the lemon juice and salt. Cover the pan, and set it over medium-low heat. 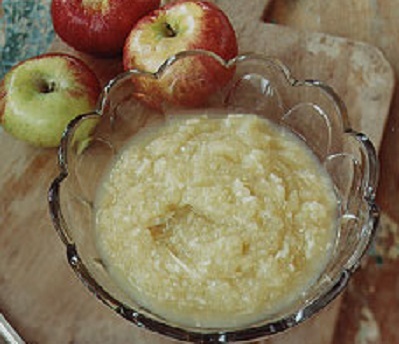 Cook the apples slowly for 15 minutes, stirring several times, as they soften. Remove the cover, raise the heat to bring to a boil. Cook for 10 minutes or until the juices are syrupy and the apples are very soft. Turn off the heat. Peel the horseradish and grate it into fine shreds, until you have at least 1/2 cup, for a milder taste, or 1 cup, for a stronger taste. With a potato masher, crush the apples into a chunky sauce. Stir in the grated horseradish and cream and pour into a serving bowl. Serve warm or cold. Preheat the oven to 400°F. Wrap the beets, two at a time, in aluminum foil. Place the beets on a baking pan and roast until tender. The amount of time will vary by the size and even variety of the beet; but start checking around 45 minutes, as it could take as long as 40-45 minutes more. Use the tip of a sharp knife to test; if the knife goes into the beets with little resistance, they are done. Whisk together the sour cream, Greek yogurt, garlic, horseradish, lemon juice, cayenne and salt (to taste). Gently fold in the chopped dill. Cover and refrigerate while the beets are roasting to let the flavors blend. Preheat the broiler in your oven. Place clams in their half shells on a baking pan; drizzle with olive oil and set aside. In a small bowl, combine horseradish and panko crumbs; sprinkle over clams and lightly pat down. Squeeze the juice from 1 of the lemon halves over the clams and drizzle with olive oil. 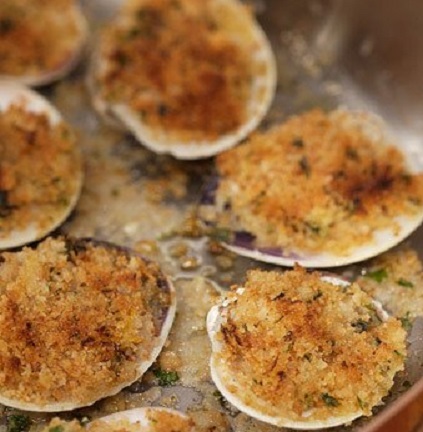 Place clams under the broiler and cook until crumbs are light golden and bubbly, about 5-6 minutes. Drizzle clams with the white wine halfway through cooking. Transfer clams to a serving plate..
Cut remaining lemon half into 4 wedges and serve with the clams. Preheat the oven to 300 degrees F and position a rack in the middle of the oven. Liberally sprinkle the entire roast with salt and pepper. Heat the oil in a Dutch oven over medium-high heat. Brown the roast on all sides until golden brown. Add the remaining beef ingredients and place the pot in the oven. Cook the roast, turning every 30 minutes, until very tender, 3 1/2 to 4 hours. Transfer the roast to a cutting board and tent with foil. 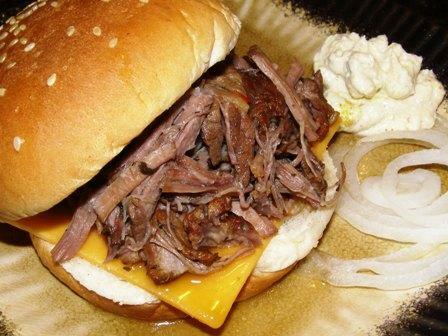 Once cooled a bit, shred the meat into smaller pieces for the sandwiches. Place roast in slow cooker and add the remaining beef ingredients, except the oil, over the top of the meat. Cover and cook on low for 10 to 12 hours. Slice or shred the meat. Mix everything together. Refrigerate until ready to use. Preheat the broiler. Toast the rolls. Spread a little horseradish sauce on both sides of the toasted rolls. Add a layer of beef, top with sliced onion and then a piece of provolone cheese. Place under the broiler for a minute or two until the cheese is melted. Mix the ingredients together and refrigerate until serving time. In a mixing bowl combine grated horseradish, Asiago, melted butter and rosemary. 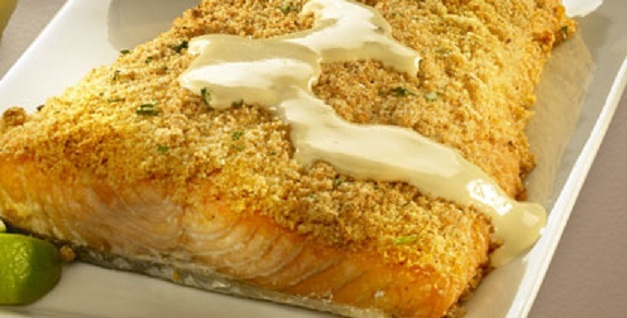 Brush each salmon fillet with olive oil and coat with the Asiago cheese mixture. Remove from the oven to a serving platter and drizzle with the Dijon sauce. Serve with fresh lime. 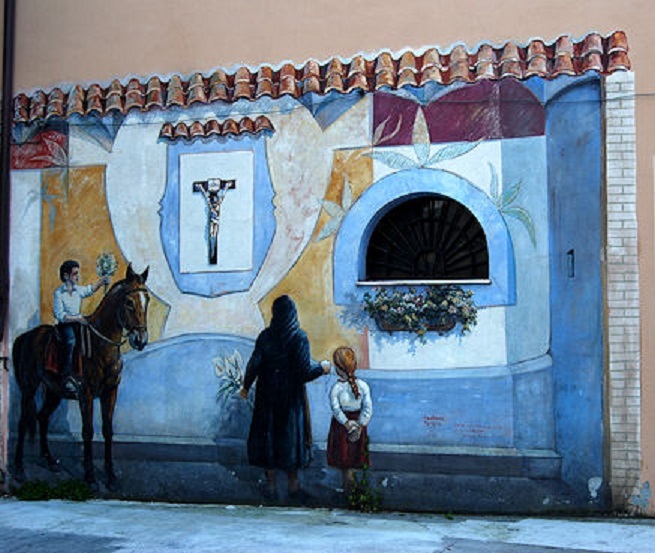 San Sperate has a very ancient history. Recent archaeological excavations have dated the first settlements to the Bronze Age. 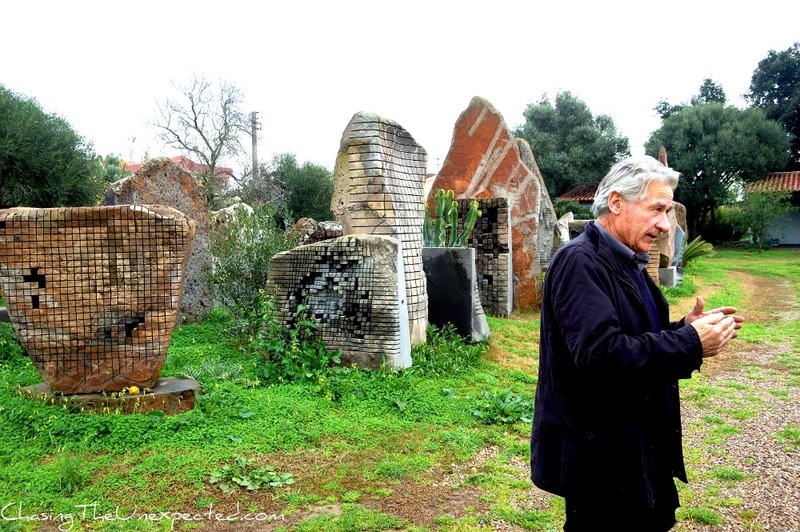 Following the period of Punic rule in Sardinia, the villages in the San Sperate basin came under Carthaginian rule and four cemeteries from this period have been found. Roman occupation in 238 BC can be documented and the parish church dates to the XVI century. 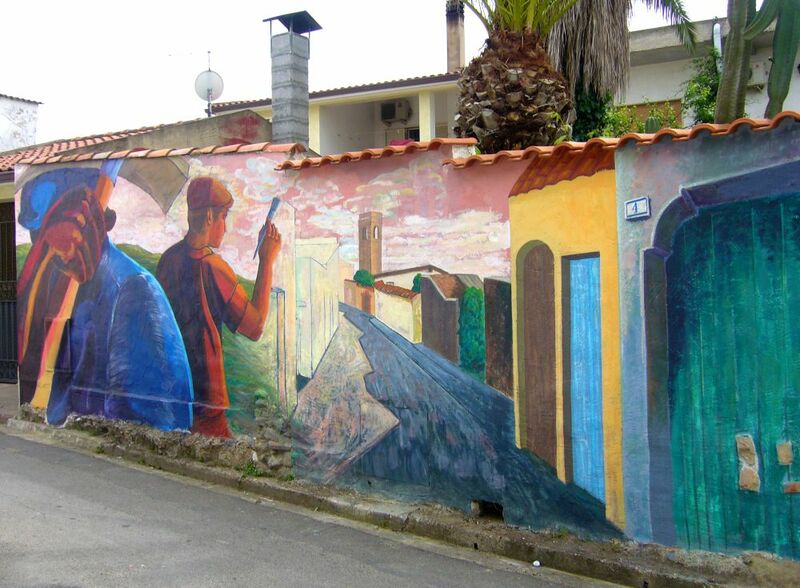 This small village in Sardinia, not far from Cagliari, is known for the “Paese Museo” (Museum Village) and its artistic features. 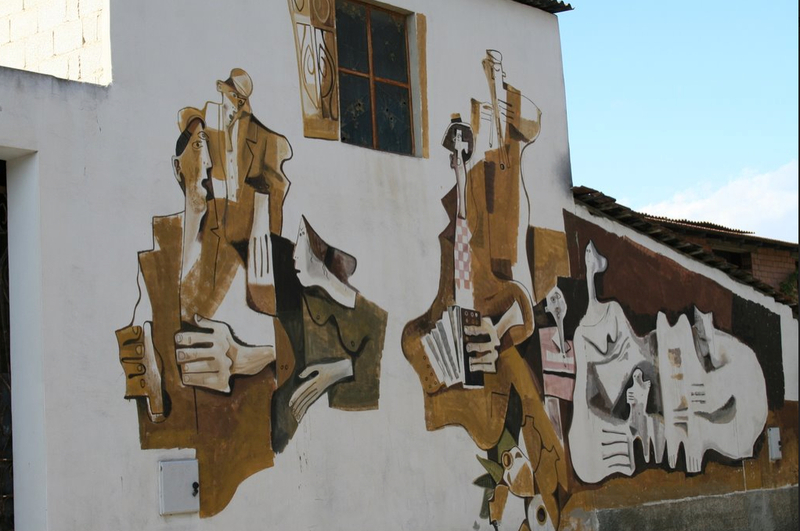 It is a village of murals with more than 300 large wall paintings. 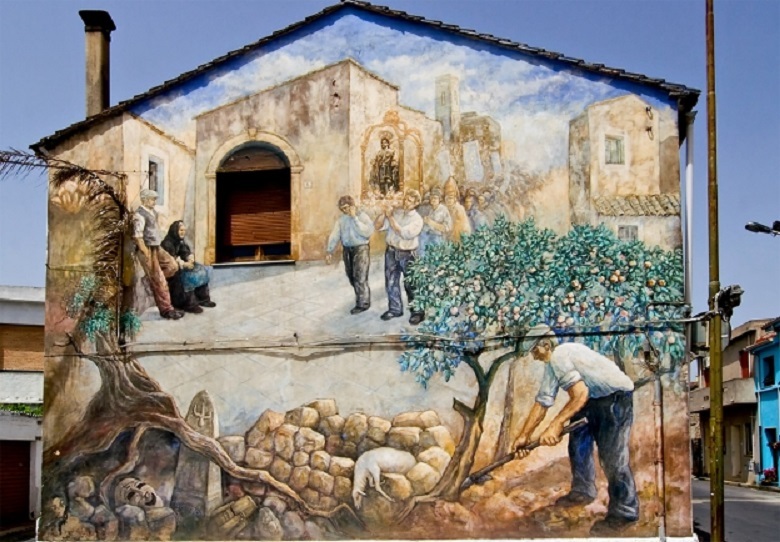 Painting the walls of its houses was begun by a local artist, Pinuccio Sciola. 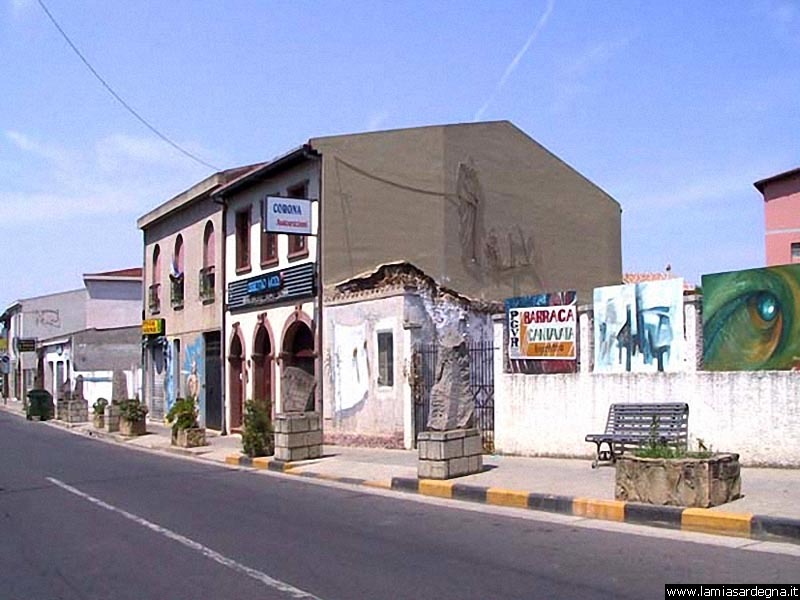 In 1968, in the wake of a youth protest movement, Sciola had the idea of turning the village into an open-air “museum village”. 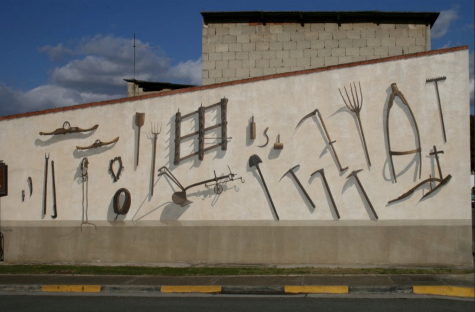 The idea was taken up by other artists such as Foiso Fois, Liliana Canu, Primo Pantoli, Giorgio Princivalle, Gaetano Brundu, Nando Pintus, Giovanni Thermes and Franco Putzolu. 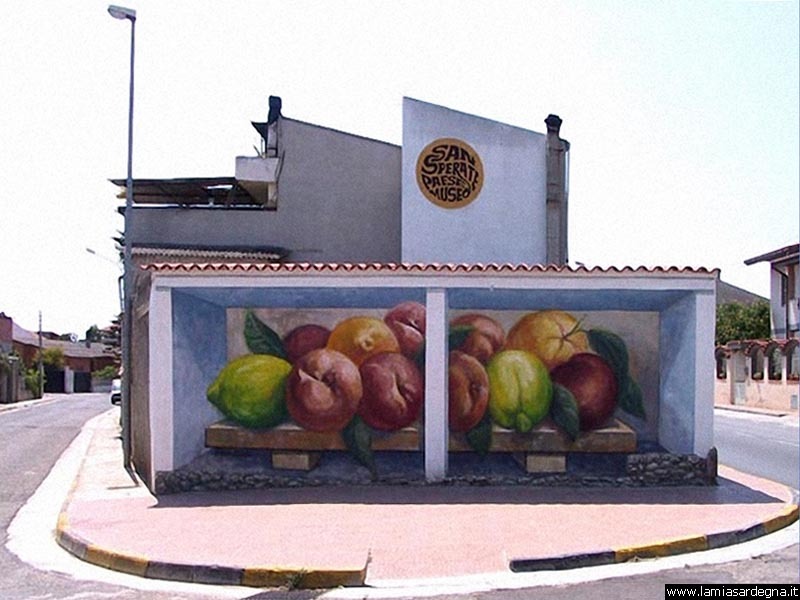 They came to San Sperate to add their own different styles and techniques. The result ranged from trompe l’oeil windows, balconies and lines of washing hung out to dry to historic scenes and copies of famous works of art. 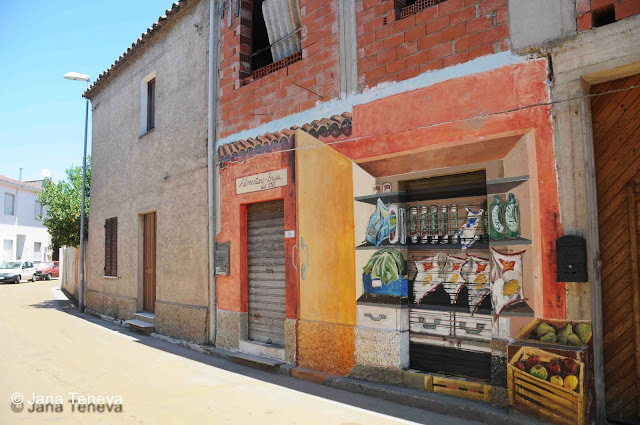 One artist from the Renaissance period, Piero della Francesca, must have been popular because there are several copies of his most famous paintings scattered throughout the village, including one next to a bakery that has an image of a single oven on its wall. 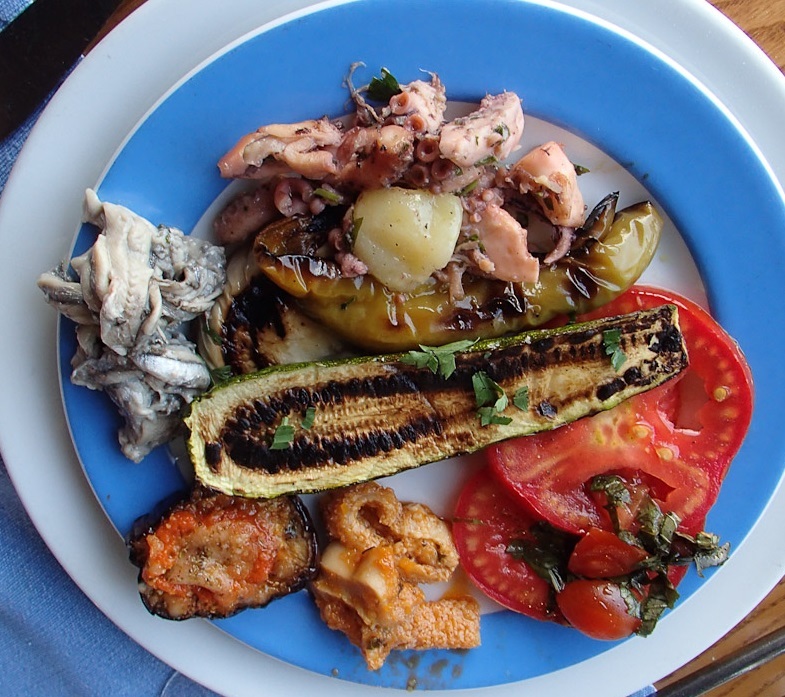 Sardinian food ranges from soups and stews, seafood, freshly baked breads, olives and wine to roasted lamb, sheep’s milk cheeses and pastries. Rinse the fennel fronds, pat them dry and chop them. Save the fennel bulbs for another recipe. Peel and dice the potatoes. Blanch, peel, seed, chop and drain the tomatoes. Heat the oil in a soup pot, sauté the tomatoes for a minute and as soon as they begin to wilt add the beans, fennel, potatoes and ham. Add 2 1/2 quarts (2.5 l) of water, cover, and simmer for at least two hours. Remove the ham bone and stir in the pasta. Continue to simmer, stirring occasionally, until the pasta is cooked. Serve with grated pecorino on the side. Heat the olive oil in a saucepan or Dutch oven large enough to contain the leg of lamb and sauté the minced garlic, parsley and onion until the onion is translucent. Remove the mixture from the saucepan to a bowl with a slotted spoon, leaving the pan drippings behind. When the onion mixture has cooled, mix it with the sausage, eggs and bread crumbs. Season with salt and pepper. Spread the mixture over the inside of the leg of lamb. Roll the leg up tightly and tie it with twine. Reheat the pan drippings in the saucepan and brown the meat, turning it to brown all sides. Add the tomatoes, crumbling them between your fingers, add enough water to reach part-way up the sides of the pot and simmer gently for an hour or until the meat is quite tender. When the meat is done, remove it from the pot. Remove and discard the string, slice the meat and arrange the pieces on a warmed platter. Spoon the sauce over the meat and serve at once. Preheat the oven to 380 degrees F (190 C). Squeeze the orange, warm the juice slightly and dissolve the saffron in it. Mash the ricotta with the tines of a fork, mixing until it is creamy in texture and combine it with the sugar, grated orange and lemon zest, eggs and half the orange juice mixed with saffron. Mix well, fold in the flour and baking powder and then pour the batter into a floured ring mold baking pan. 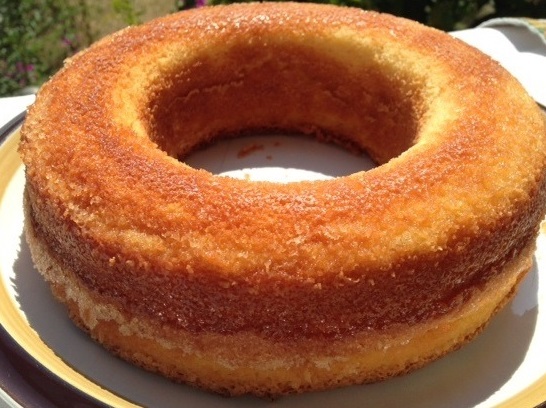 Brush the surface of the cake with the remaining orange juice, sprinkle with sugar and bake until it begins to pull away from the sides of the pan and a toothpick inserted into the center comes out dry, about 40 minutes, but check before then. Eggplant has been vastly under-used by the American public. Today, thanks to Asian and Southern European influences, it is finding its way into more and more dishes. It is a good meat substitute which also makes it attractive to vegetarians. Eggplant actually has a bland flavor, but it soaks up flavors of accompanying foods, herbs and spices like a sponge. The eggplant is considered a vegetable but is botanically a fruit. Early varieties of eggplant were smaller and white, resembling eggs, hence the name. Eggplants come in all shapes, from small, round fruits (about two inches in diameter) to the popular large oblong Black Beauty variety, which can range up to 12 inches long. Japanese eggplant is long and thin, resembling zucchini and has fewer seeds. The seeds are edible in all varieties. 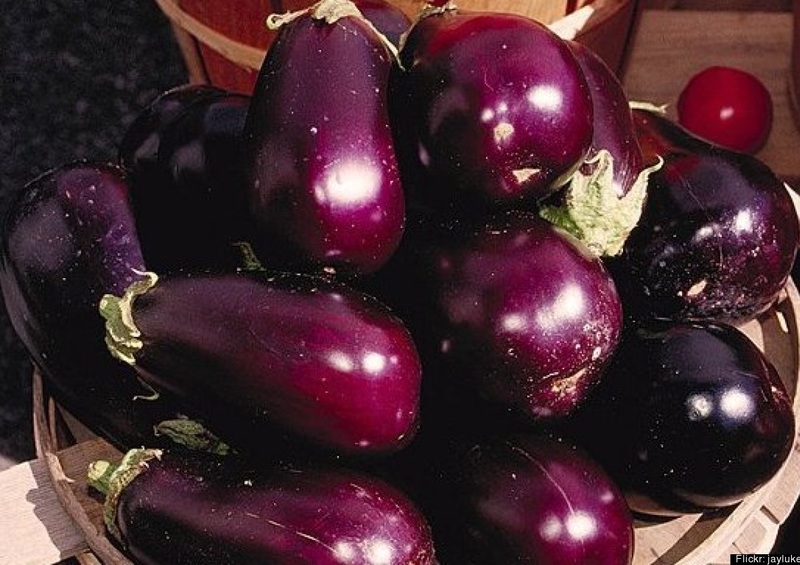 Eggplant colors range from white to lavender to dark purplish-black as well as pale green, yellow and reddish. There are even some striped varieties. Eggplant varieties may be used interchangeably in your recipes. When shopping, choose eggplants with smooth, shiny skin, heavy for their size and free of blemishes, tan patches or bruises. Wrinkled, loose skin is an indication of age and the fruit will be bitter. Smaller eggplants have fewer seeds, thinner skin and tend to be sweeter, more tender and less bitter. Press your finger lightly against the skin. If it leaves a light imprint, it is ripe. If it is soft, it is too old. Eggplant is quite perishable and will not store long. Depending on the freshness factor of the eggplant at the time of purchase, it may be refrigerated for up to 4 days (up to 7 days if you pick right from the garden). However, it is best to use them as soon as possible, preferably within a day. Handle eggplants carefully as they bruise easily. Wrap each in a paper towel and place in a perforated plastic bag before storing in the refrigerator vegetable bin. Do not store eggplant at temperatures less than 50 degrees F (10 degrees C). Cooked eggplant may be refrigerated up to 3 days (it will get mushy when reheated) or frozen up to 6 months in a puree form. It holds up fairly well in chunks in soups and stews when thawed in the refrigerator, but not as chunks on its own. 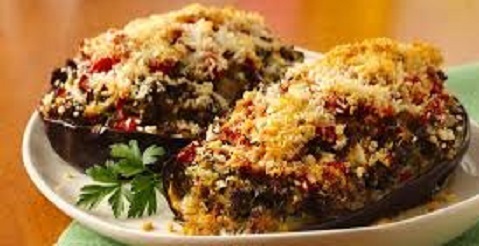 I have had great success in freezing breaded, oven baked eggplant slices to use in future eggplant parmesan recipes. I freeze them in single layer packages and pull out what I need for a casserole. Eggplant skin is edible. However, some find it bitter. The flesh is very sponge-like and will soak up juices and oils. Coat slices with flour, beaten egg and bread crumbs to avoid soaking up too much oil. Let breaded patties dry for half an hour in the refrigerator before cooking. Parboiling slices for 1 to 2 minutes can also help reduce eggplant’s absorbancy, while ridding it of moisture. Be sure to thoroughly drain and pat dry with paper towels before further cooking. Once cut, eggplant flesh will begin to darken with exposure to air. A brushing of lemon juice will help keep the flesh from darkening. Do not use aluminum cookware with eggplant as it will cause discoloration. Some cooks salt cut eggplant and let it sit for up to an hour to leach out water and bitterness before cooking. In general, it’s not necessary to salt smaller eggplants, since they have fewer seeds than larger eggplants. Larger eggplants tend to become soft when cooked, so salting them before cooking leads to a firmer cooked texture. Bitterness is concentrated just under the skin, so peeling will also work on especially large eggplants. Here are the directions, if you choose salting. Slice the eggplant according to your recipe and generously season the slices with kosher salt. Let them sit until you can see the liquid coming to the surface, 20-30 minutes (see photo above). Rinse the slices well and pat them dry. It’s also a good idea to use half as much salt as the recipe calls for (unless the recipe takes into account the fact that the eggplant has been salted). Eggplant may be microwaved to remove excess water. Microwave slices on high for 4 to 6 minutes, remove, cover and let stand for a minute or two. Use paper towels and press lightly to soak up the water. If you are baking a whole eggplant, be sure to puncture the skin in several places so it does not burst. Add eggplant to soups and stews during the last 10 minutes of cooking to avoid overcooking. • 1 medium eggplant = about 1 pound. • 1 medium eggplant = 4 to 6 servings. • 1 pound eggplant = 3 to 4 cups diced. • 1 serving = 1/3 pound as a side dish. • 1 serving = 1/2 to 3/4 pound as a main dish. Heat the 1 tablespoon olive oil in a large pot over medium-high heat. Add onions and garlic and sauté until onions are translucent, about 10 minutes. Add celery, carrots and 1/4 teaspoon each salt and pepper. Saute until all the vegetables are soft, about 10 more minutes. Add tomatoes and bay leaf and simmer, uncovered, over low heat until the sauce thickens, about 1 hour. Remove and discard the bay leaf. Meanwhile, heat oil from the sun-dried tomato jar in a large, heavy skillet over medium heat. Add the diced eggplant and cook, stirring occasionally, until golden, about 6 minutes. Add the sun-dried tomatoes and the marinara sauce and cook until heated through, about 5 minutes. Add the cooked pasta to the tomato sauce and stir to combine. Turn off the heat and add the mozzarella cheese, basil, salt and pepper. 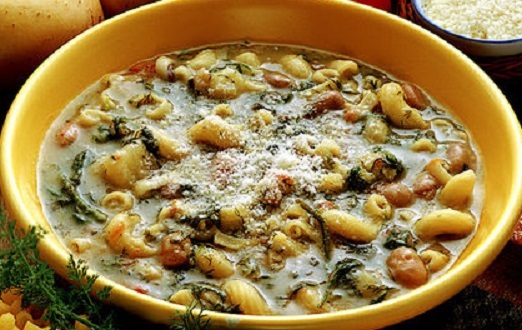 Serve in shallow pasta bowls, topped with Parmesan cheese and crushed red pepper, if desired. Mix and knead all of the ingredients — by hand or mixer — to make a soft, supple dough. Place the dough in a lightly greased bowl, cover, and let rest for 15 minutes. Brush a thin coating of the garlic oil onto each side of the eggplant rounds and sprinkle with salt and pepper. Place the eggplant rounds on the grill and cook for 5 minutes or until you see well-defined grill marks. Turn the rounds over and cook for another 3 to 5 minutes to achieve the same grill marks. Add the pepper and tomato slices, coated with garlic oil, during the last 2 minutes of grilling. Transfer to a plate until you’re ready to top the flatbreads. Divide the dough in half. Place each half on a lightly greased sheet of parchment paper and stretch into 1/4″-thick irregular ovals. Flip one piece of dough from the greased parchment onto the heated grill. Cook for 2 to 3 minutes, until you see well-defined grill marks; then turn over. Spread half the pesto onto the grilled side of the crust. Top with the grilled eggplant, peppers, tomatoes and cheese. Close the grill and cook 2 to 3 minutes longer, then transfer to a serving plate. Repeat with the second piece of dough. Garnish flatbreads with basil leaves, if desired, and serve warm. Preheat your oven to 450°F (with or without a baking stone). One at a time, place the rolled-out pieces of dough with their parchment directly onto a preheated pizza stone or onto a baking sheet. Bake until the dough is just starting to brown around the edges, about 4 minutes. Grill vegetable slices on a stove top grill following directions above. 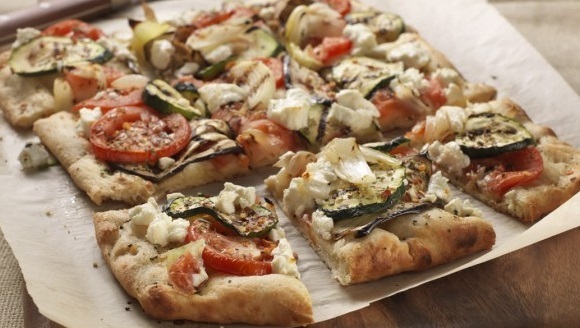 Remove crust from the oven, add toppings and bake for an additional 6 minutes, or until the pizzas are warm and bubbly. Preheat the oven to 350 degrees F. Heat a large skillet over medium heat and add sausage. Cook until browned, 8-10 minutes, breaking up sausage into pieces. Remove sausage from pan, drain on paper towels and set aside in a mixing bowl. To the same skillet, add olive oil, onion and garlic. Cook until almost tender, 3-5 minutes. Add eggplant flesh and salt; cook until browned. Remove from heat and transfer to the bowl with the sausage. Add parsley, chopped tomato, basil, thyme, marjoram, cayenne, the half cup mozzarella and the half cup Parmesan cheese, bread crumbs, egg and salt and pepper to taste. Stir to blend mixture evenly, then stuff into eggplant halves. Place stuffed eggplant on a baking sheet, top with remaining cheeses. Bake 45-50 minutes until tender. I often make these for parties and they are a big hit with my vegetarian and non-vegetarian friends. Preheat the oven to 350°F. Prick the eggplant all over with a fork and place on a baking pan. 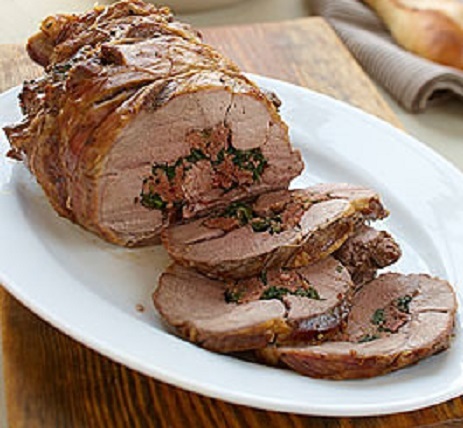 Roast in the center of the oven for 1 hour, until very soft and collapsed. Let cool slightly, then scrape the eggplant flesh into a large mixing bowl and let cool completely. Discard the skin. Mix the cheese, onion, garlic, parsley, egg, salt, pepper and 1 cup of the bread crumbs into eggplant pulp. Stir with a wooden spoon or your hands until ingredients are thoroughly combined and mixture holds together. Refrigerate mixture for 15 minutes, then roll into balls. 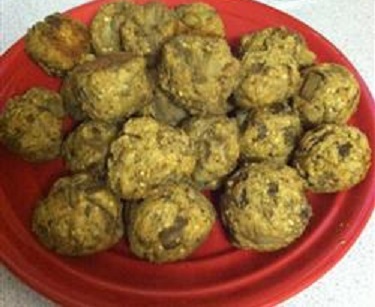 Roll the outside of the balls in the ¼ cup remaining bread crumbs. Spray a baking sheet with cooking spray. Place eggplant balls on prepared baking sheet and spray with olive oil cooking spray. Bake for 30 minutes turning once until nicely browned. Serve with warm marinara sauce, if desired. Heat oven to 450°F. Line a baking sheet (cookie) pan with parchment paper or a silicone baking mat. Spray with olive oil cooking spray. In a shallow bowl mix flour with salt and pepper. In another shallow bowl, beat egg with milk. In another shallow bowl, mix panko crumbs, crushed pepper flakes, garlic powder and paprika. 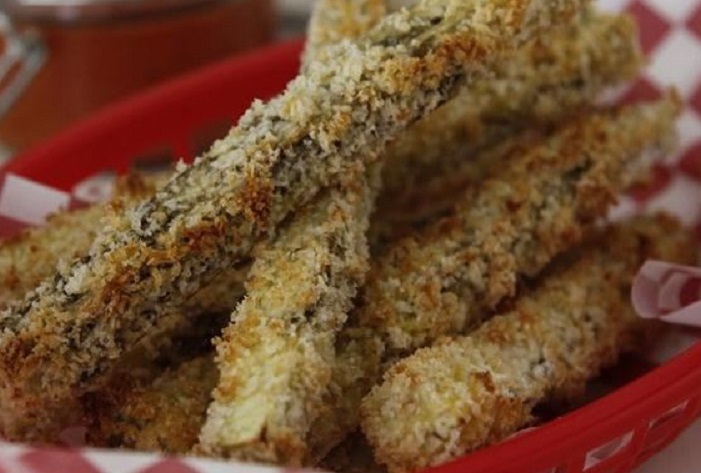 Dip eggplant strips into flour coating all sides; shake off excess. Dip in egg mixture. Roll in bread crumb mixture until coated. Place on prepared baking pan. Spray with olive oil cooking spray. Combine all ingredients in a medium-sized bowl. Place in the refrigerator for 1 hour to chill and allow flavors to combine.